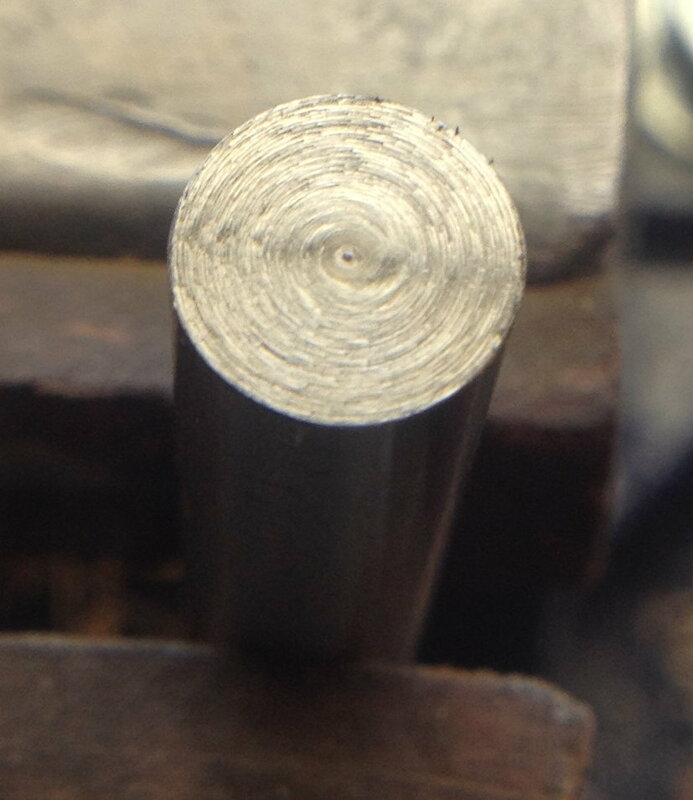 There is something magical about the ability to anneal1 high-carbon steel, work it into a useful tool, then harden and temper it so that it can hold a sharp cutting edge for a long time. 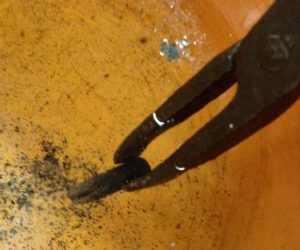 It was one of the most important discoveries of the Iron Age, enabling the manufacture of tools that were far superior to those made of softer metals like copper, bronze and wrought iron. I have made a few hardened steel tools of my own; wood carving knives and gouges, and simple punches. 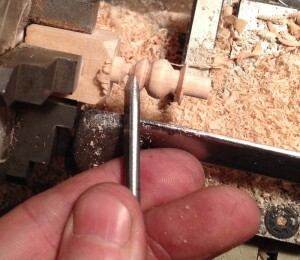 It is a wonderful and exciting feeling to use a tool that you made yourself. Part of the process of hardening tool-steel involves heating it to something in the region of 760-800C2 and holding it at that temperature for a while. If the temperature is too low the steel won’t harden properly, and if it’s much too high you get a coarse grain forming inside the metal that will affect your ability to sharpen the tool. In the past I’ve heated my tools using either an open solid-fuel forge or a propane blowtorch, but in both cases it is difficult to accurately gauge and regulate the temperature. 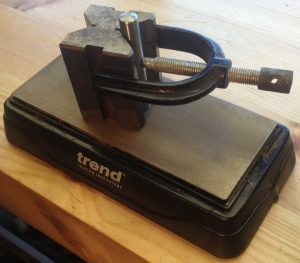 Because I need to make more tools for concertina production (mainly press dies), I’ve been looking out for a better way to heat them. 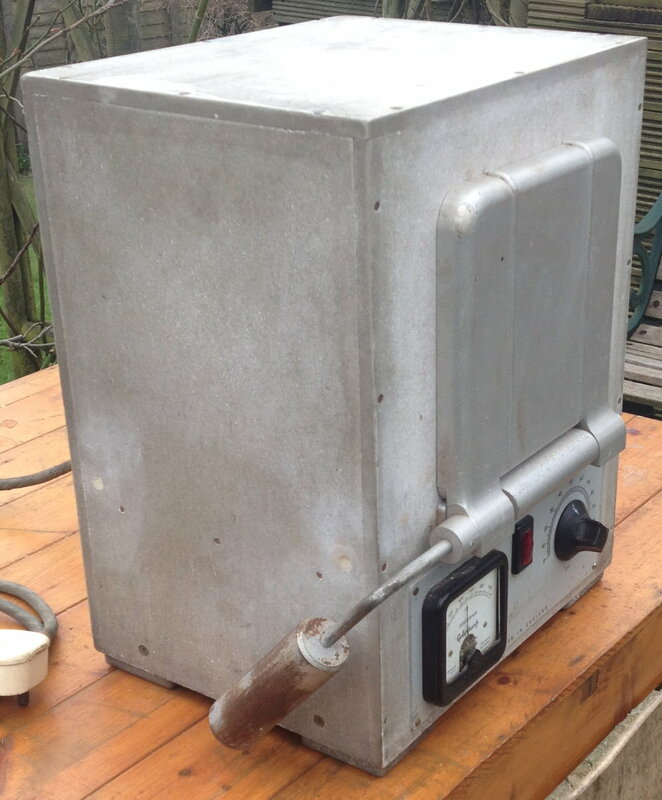 Recently I came across an old electric laboratory muffle furnace on eBay. Luckily I managed to get it very cheaply because it was described as faulty and it was near enough for me to collect it in person. It looked to be in good condition in the photos, and I figured that even if the heating element had burned out, it would be cheaper and easier to re-wind it than to build one from scratch. The fault turned out to be very simple. It is supposed to have a fusible link inside the inner chamber that melts if you overheat it (a thermal fuse). This was probably quite easy to do because the original controller was a simple simmerstat3, and I suspect leaving it at 100% would cause it to reach melting point in about 45 minutes. The thermal fuse was missing. As a temporary measure I bypassed it and the oven fired straight up. 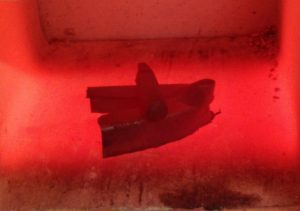 I learned nearly everything I know about heat-treatment of steel from Hardening, Tempering & Heat Treatment by Tubal Cain from the Model Engineer’s Workshop Practice series. It was only after I’d bought my oven that I happened to be flicking through the book and saw a picture of it: the author had the same model! 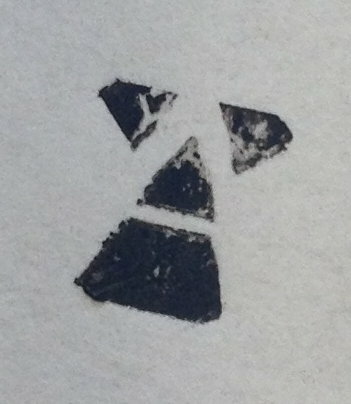 Tubal Cain had replaced the simmerstat in his heat treatment oven with an early computerised temperature controller. 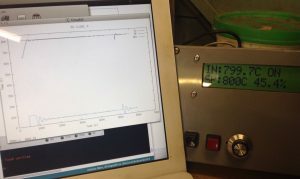 I wanted to do the same thing, and I could have simply bought a fairly cheap Chinese PID controller like the one I used on my glue pot (though high-temperature ones seem a bit harder to find and more expensive), but for various reasons I decided to build my own instead. I used a MAX31855 thermocouple interface from Adafruit, an Arduino Nano clone, a solid state relay, a 16×2 alphanumeric LCD (HD44780 compatible), a couple of push buttons and a rotary encoder stuffed into a plastic project box. Because I already had most of the parts other than the high-temperature K-type thermocouple (which I would have had to buy anyway) and the MAX31855, the project worked out pretty cheap. I developed the firmware using the Arduino IDE and several off-the-shelf open source libraries. This is the first time I’ve used the Arduino system, though I’ve done quite a bit of embedded programming in the past. I must admit a decent C++ compiler and a large set of libraries made it pretty easy to quickly bolt something together, though the lack of a debugger is a bit of a pain, and some of the libraries are poorly documented and/or provided with example code that doesn’t work properly out of the box. 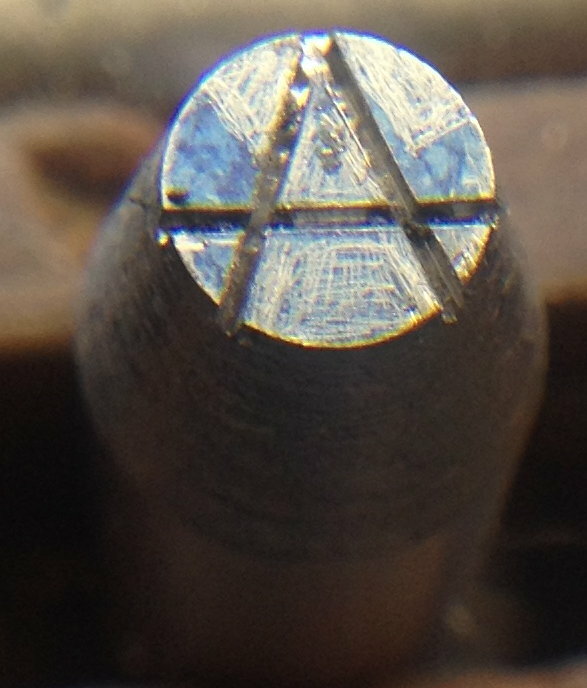 For years I have been fascinated by how punches and dies were made prior to the invention of the rotary engraving machine. 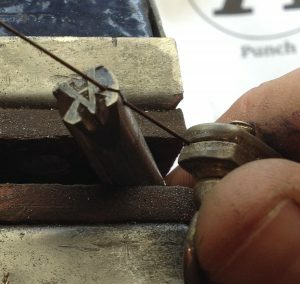 I’ve read what I’ve been able to find on the subject (not very much, to be honest) and studied some antique punches to try to work out how they were made. 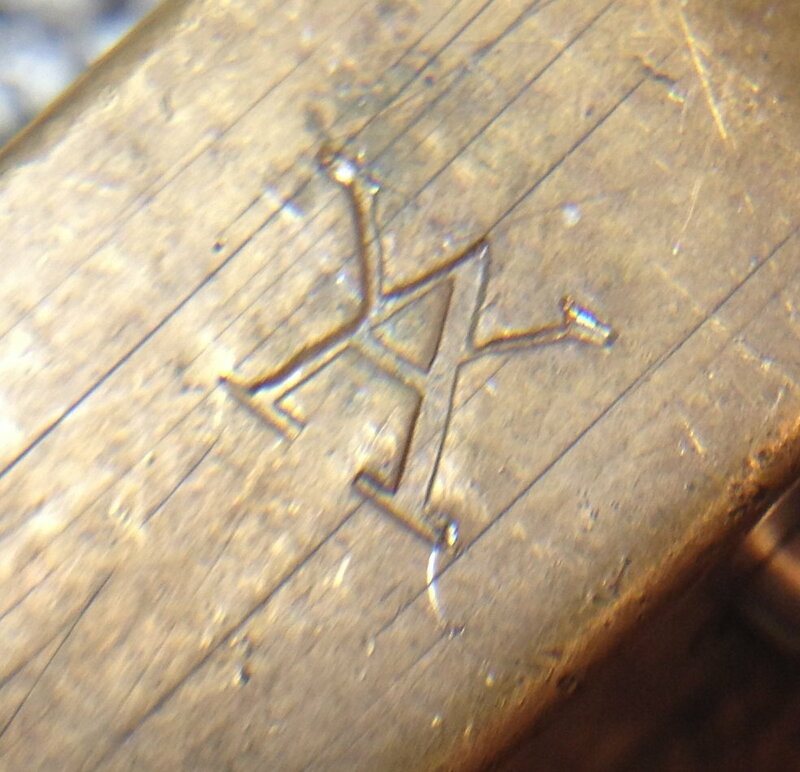 I decided to try making a punch from my maker’s mark to see if my ideas were practical. I think positive punches and single-line name stamps usually used at least one counterpunch per letter to form the hollow spaces (the counters), and the outside waste was cut away with saws, files and probably a selection of gravers. 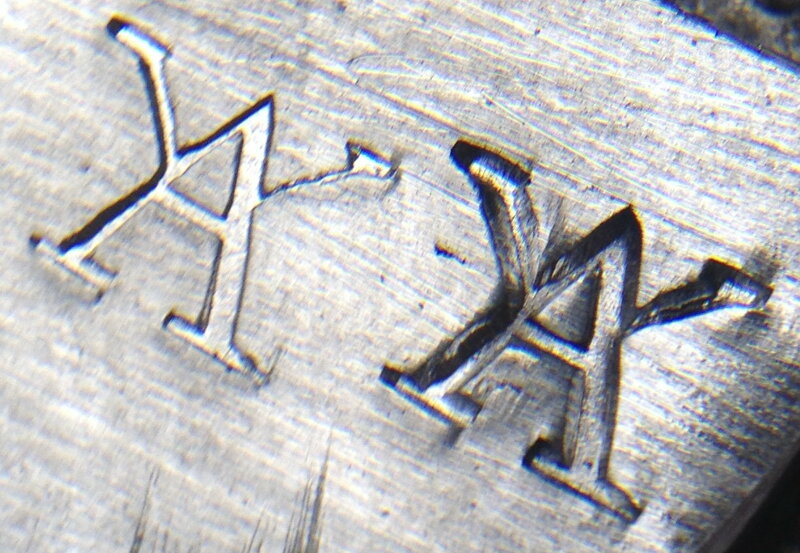 There were also negative punches that were probably either entirely engraved or stamped with a set of reversed positive punches, but I’m not going to cover those today. 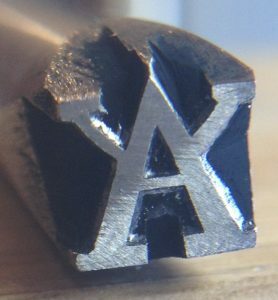 My maker’s mark is a fairly simple symbol (an upper case A with two arms added), though I wanted to challenge myself by making a serif version with multiple stroke widths. 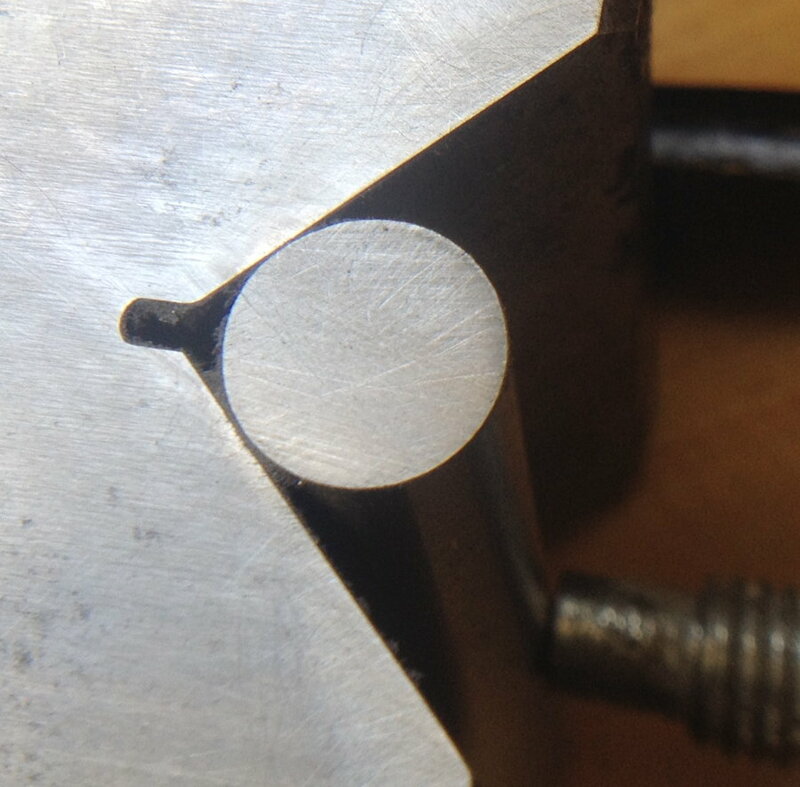 I made both the counterpunch and the punch from 3/8″ silver steel, which is a commonly-available high-carbon water-quenched tool steel with a little chromium in it that is supplied as accurately ground round bar. 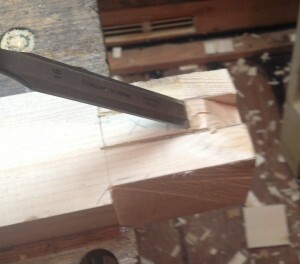 Since the counterpunch was to be smaller than the punch I first tapered the end. There are several ways to do this, but I decided to use the compound slide on my Taig lathe. I also used the lathe to face both ends to make them square, and used a file to round over the hammer ends a little so that when you strike it you don’t hit a corner. The facing process left the end that was to become the punch square and reasonably flat but very slightly rough. 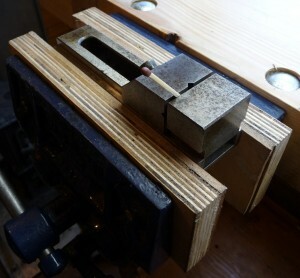 Because this might effect the performance of the finished punch I decided to lap it flat. 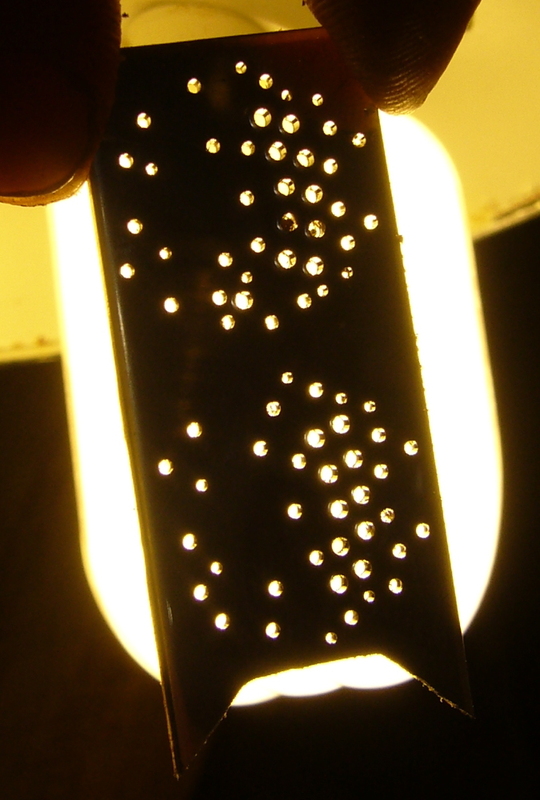 To check it was the right shape, I got it sooty in a candle flame and pressed it onto a piece of paper (this is called a smoke proof). 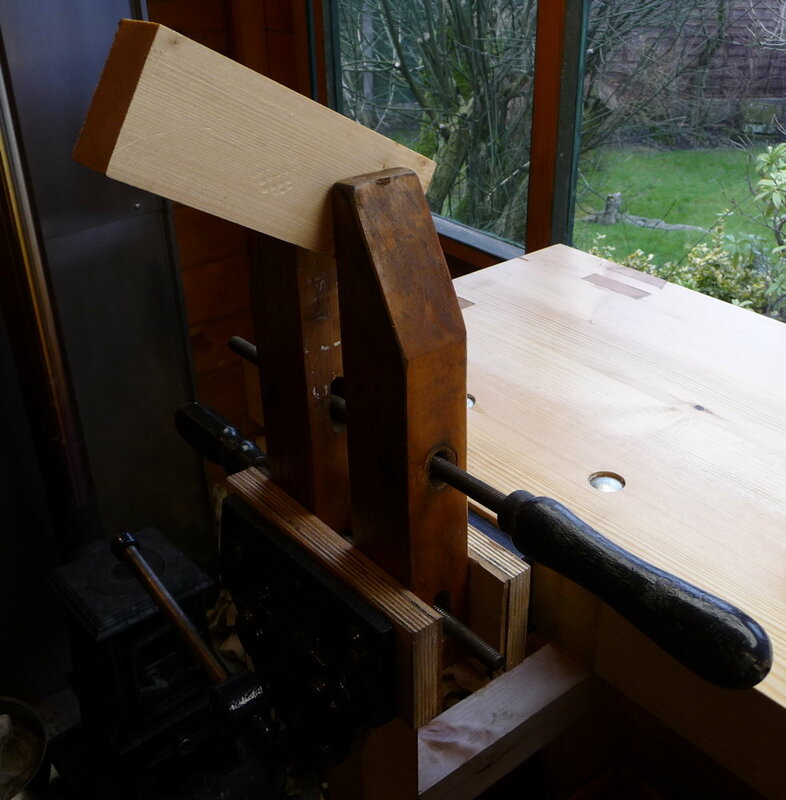 Actually I realised at this stage that I had made a mistake, but I opted to push ahead and modify the proportions of the punch to compensate rather than starting again. I could get away with this because the design of my mark is rather fluid anyway, and doesn’t have to match the style of a particular font. The final part of cutting the counterpunch was to bevel the corners and do a test punch into a piece of end-grain hardwood. 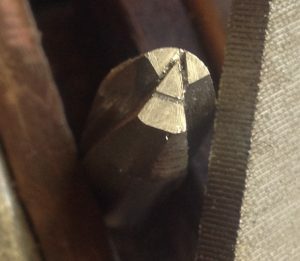 I’ve found that a punch doesn’t work very well if you don’t bevel it at all, but it’s not entirely clear to me how steep the bevel angle should be (the old punches I’ve looked at aren’t all the same). Next I had to harden the counterpunch before I could use it. 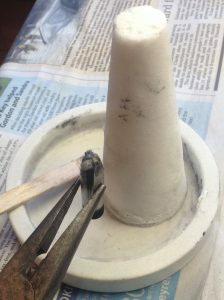 In order to reduce scale buildup and decarburising while soaking in the heat treat oven, I coat the business end of the tool in jeweller’s borax flux. Applying it isn’t an exact science. I warm the punch to not-quite boiling point, then smear some thick borax paste onto it and wait for it to dry. Once in the oven, it will bubble up a bit at first but then it should melt and flow out across the surface (you can see the difference after heat-treating; the areas that were protected by the flux are still bright underneath). I put the counterpunch into the oven on top of a piece of bent stainless steel that prevents it directly touching the oven floor. After waiting something like 20 minutes for it to get up to temperature, I let it soak for another 20 to ensure that it was fully austenized all the way through. From what I’ve read, not soaking for long enough will significantly reduce the hardness you can achieve. After soaking, I pulled it out with blacksmith’s tongs and immediately quenched it in a bucket of water. The shock actually causes most of the Borax flux to fall off, which is handy because it can be difficult to remove. 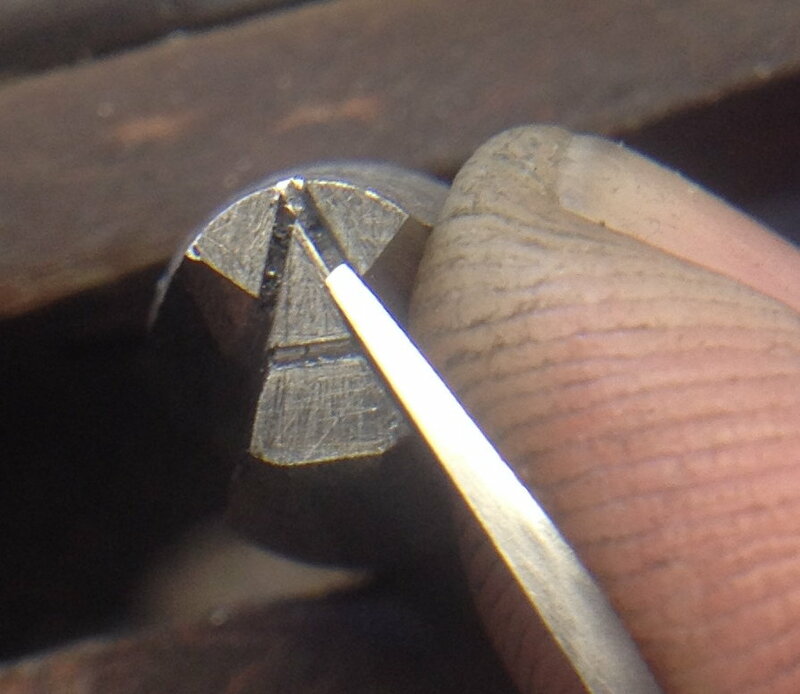 As a quick check to make sure it hardened, I see if a file will cut it. 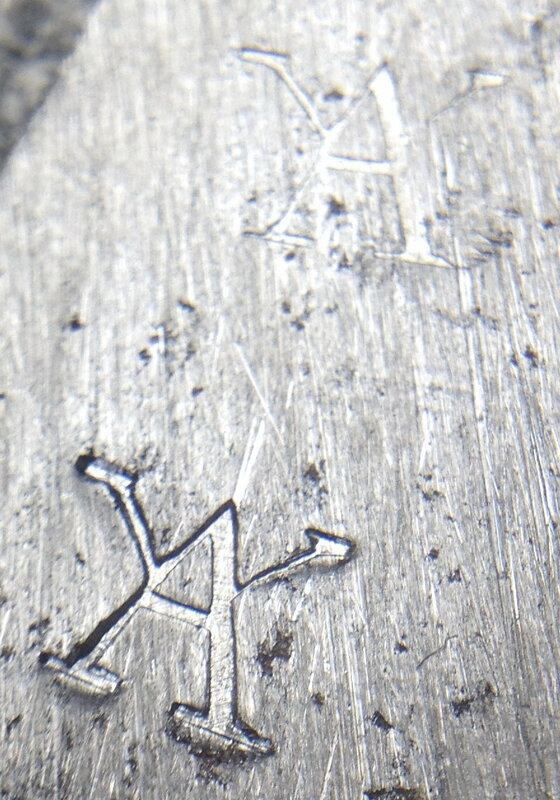 Generally it will scratch a tiny bit because of the surface decarburisation effect but it will be hard enough underneath that the file just skates off. 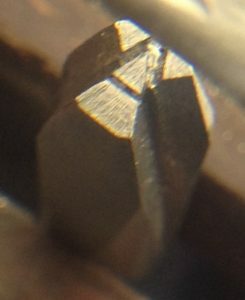 Some people recommend using a good sharp file for this test, but I find that it tends to blunt the file so I prefer using a rubbish file and just press quite hard (I have experienced a tool that didn’t harden properly and the difference was pretty obvious). 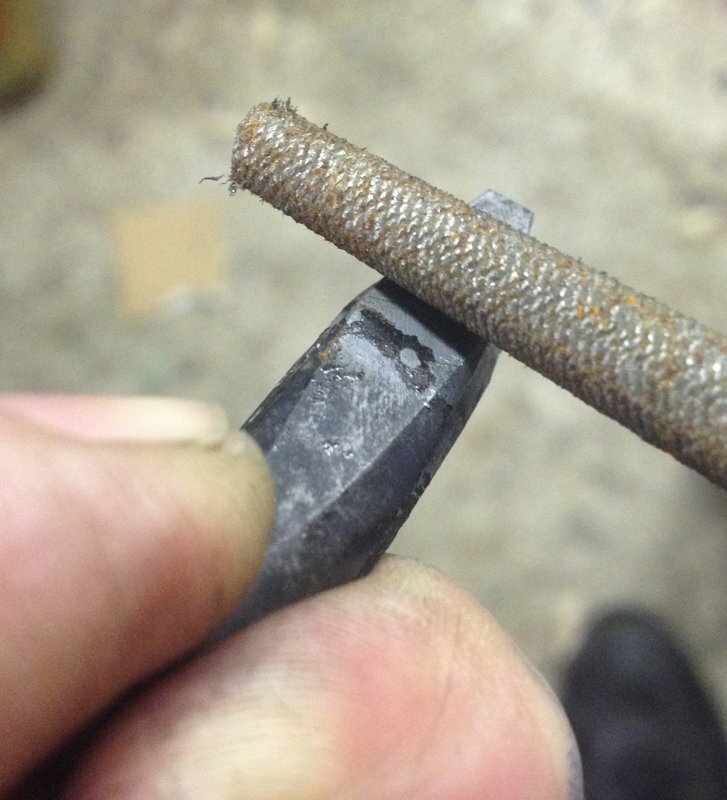 After hardening, the steel is very hard but also very brittle and highly stressed. If you’re not careful you can shatter it just by rough handling (I’ve done that with a fancy spring clip that I had just spent half an hour forging). What we do to cure this is to temper it, which means re-heating it to a lower temperature and soaking it for a while. This reduces the hardness somewhat but also reduces the internal stress and greatly increases the toughness of the steel. If you temper it lightly you end up with quite a hard tool that might be at risk of chipping. 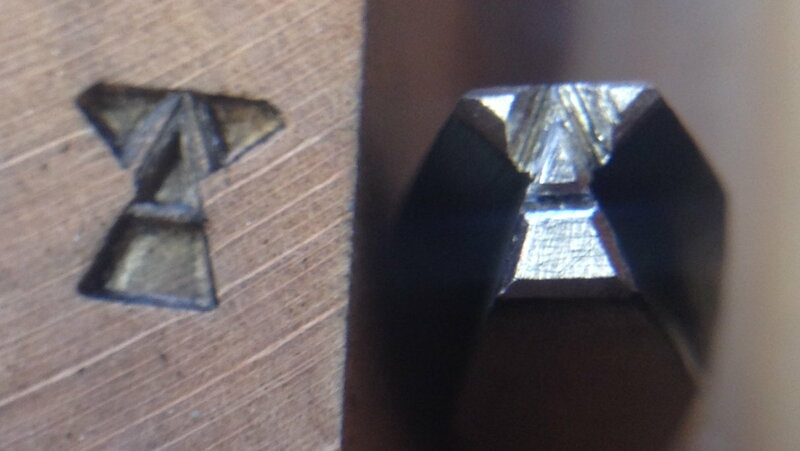 Higher tempering yields a tougher but softer tool; if you go too far the edge may tend to roll over in use. 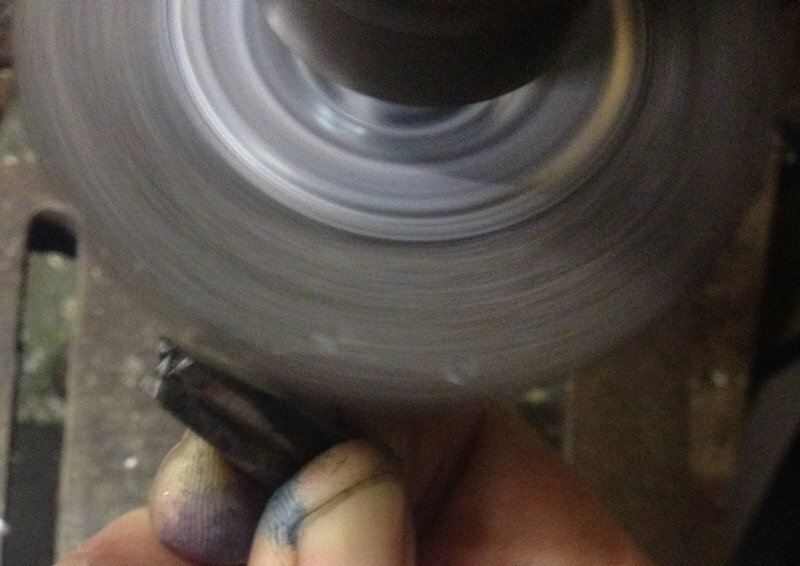 The highest levels of tempering are used to make springs. There are several ways to heat a tool for tempering. 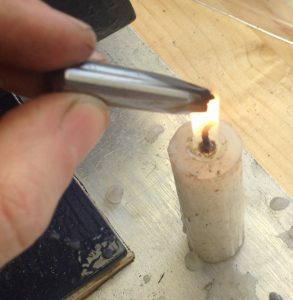 I could even use the heat treat oven itself, but it would take a few hours to cool down sufficiently and it’s not a good idea to leave the tool in its fully hard state for that long. I decided to use a small electric deep fat fryer with sunflower oil in it. 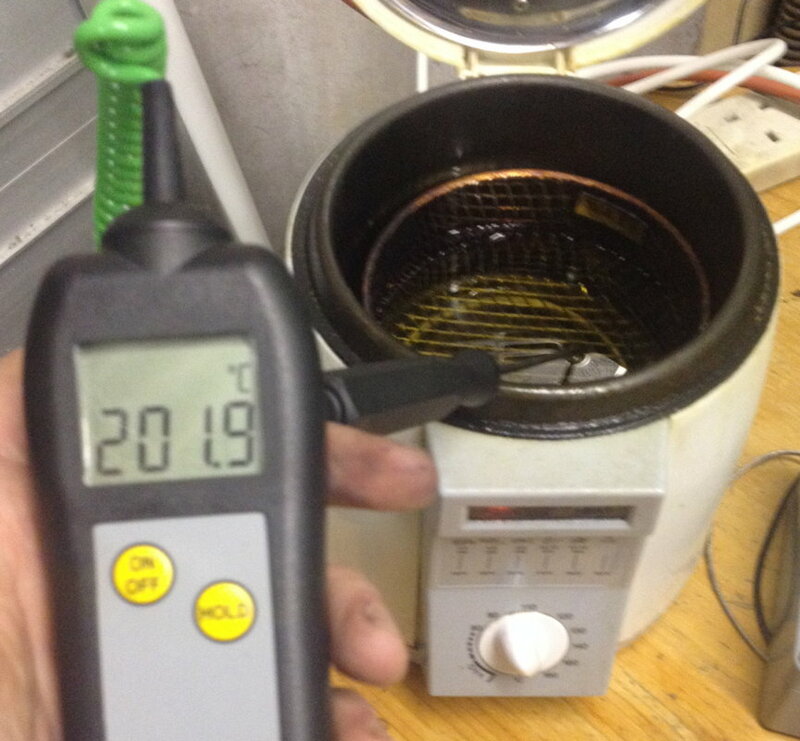 The highest temperature the thermostat will go up to is about 200C (and the oil probably wouldn’t be happy going much higher than that), which is towards the low end for tempering silver steel. After tempering I used a rotary wire brush in the pillar drill to remove the scale and any remaining flux. Finally I used a spirit burner to re-heat the blunt end up to a spring temper so that it can better resist the shock of hitting it with a hammer. It will probably mushroom eventually but it is easy to cure that by grinding. After it reached a blue colour I quenched it again to stop the heat travelling too far up the shank. 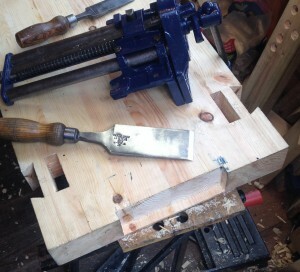 Mild steel. 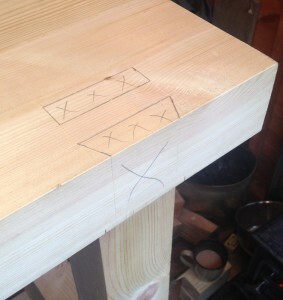 The top mark was a moderately hard strike onto the wooden bench and it’s barely visible. The bottom mark was a very hard strike backed by a steel anvil. I’m not sure I’d want to risk striking the punch that hard very often as I’m concerned the tiny serifs might be at risk of breaking off, though it didn’t suffer any visible damage as a result. 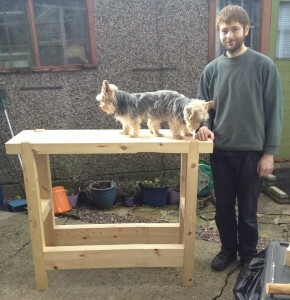 I’ve just finished building a new workbench for my concertina-making workshop. 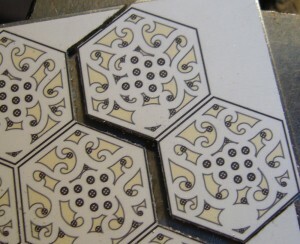 I designed it myself, loosely based on an 18th century French design described by Andre Roubo. 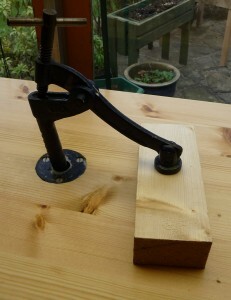 Although mine is much smaller, made from construction-grade pine, and has modern (ish: they are probably older than I am) cast iron quick release vices instead of a wooden leg vice, they do have several important elements in common. 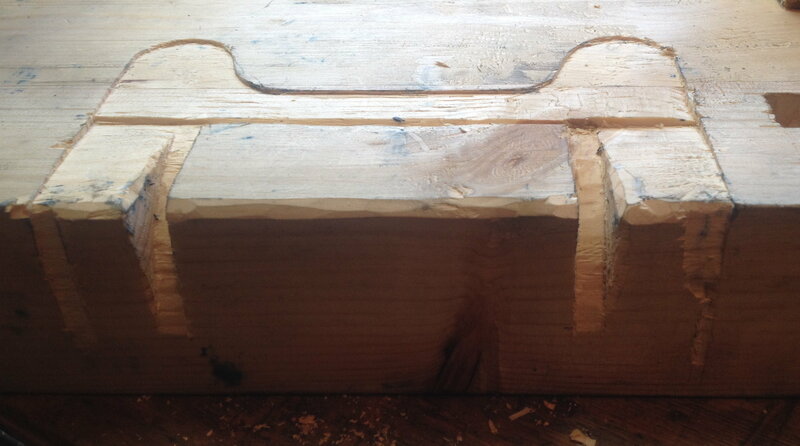 The joinery is very similar, particularly the unusual dovetailed tenons that allow the legs to come flush with the edge of the top. It has a planing stop, a front vice, a holdfast, and a tool tray between the stretchers. 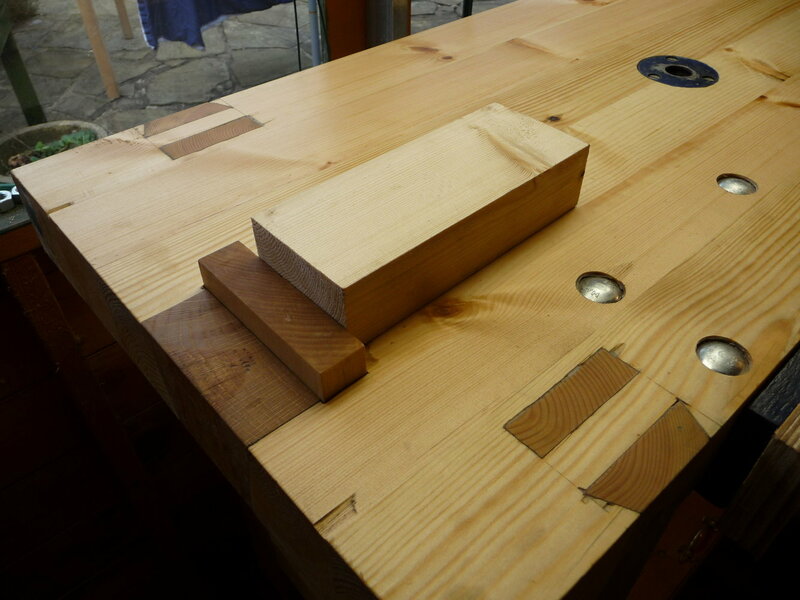 I made it 1m tall, which is on the high side for workbenches, because I mostly do fine detail work on small components, often under magnification, and in these circumstances a high bench reduces back ache from constantly bending over. 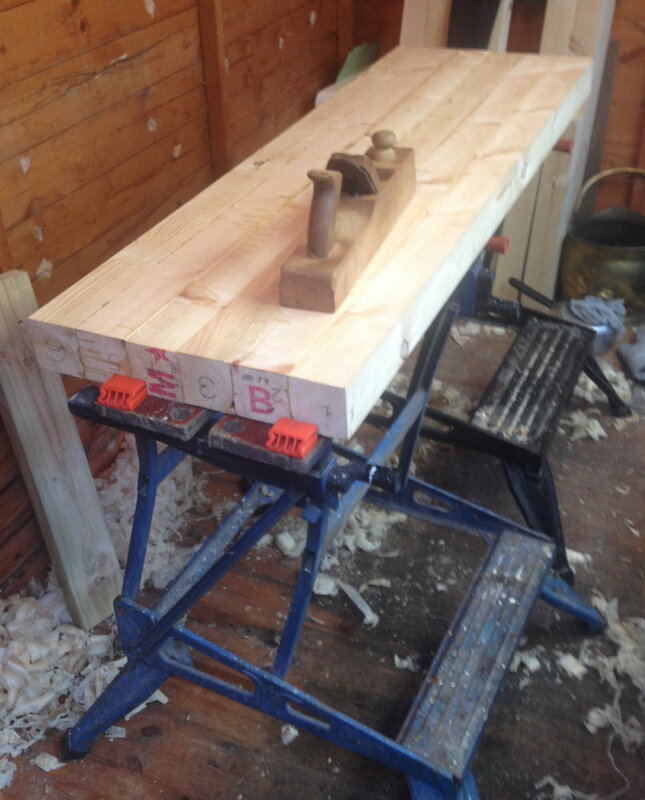 The top is 400mm deep by about 1.2m long, which I felt was the biggest I could comfortably fit in my small garden shed workshop while also fitting in a coal stove to the left of the bench and two machine tool stands along the back wall. 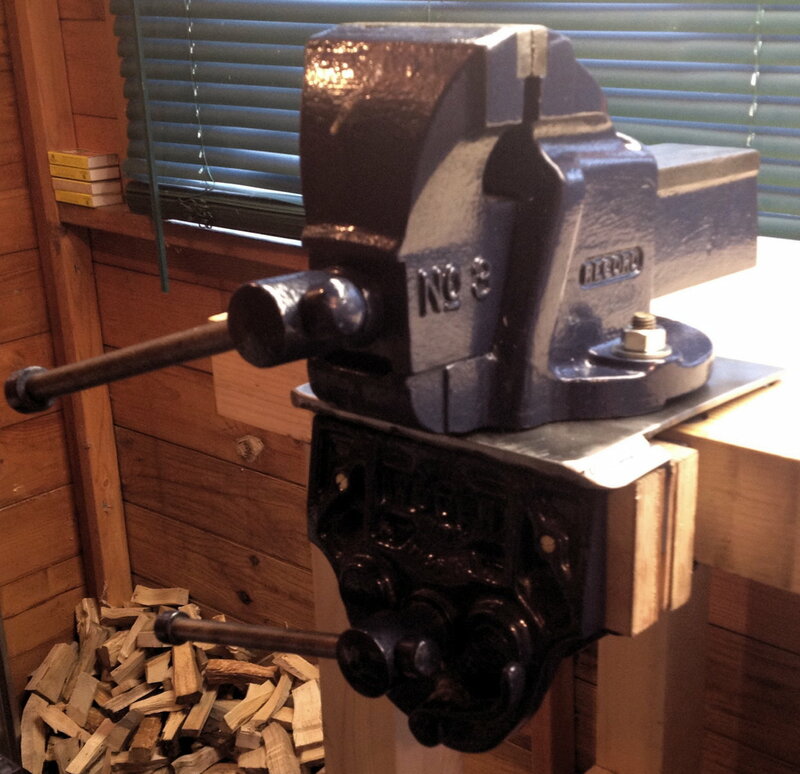 I also have a very similar Record quick-release vice, which I installed as a central tail vice with leather-lined wooden jaws that span the full width of the end of the bench. This idea is a bit of an experiment on my part, but I have a feeling it is going to come in handy (obviously I will have to be careful to avoid clamping things too far off-centre as excessive racking force could damage the vice). 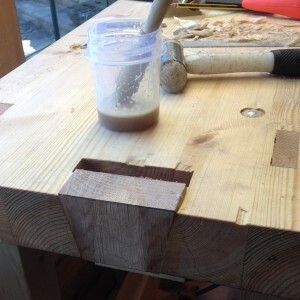 The holdfast is an important feature of Roubo’s workbench. Instead of the traditional forged iron bar that wedges into a hole when you hit it with a mallet, I went for a Woden hold-down clamp that performs pretty much the same function but with a screw to control the clamping force. It fits into a special tall cast iron collar with ridges inside that mate with notches on the back of the vertical rod, and it only came with one collar, so I put a lot of thought into the most versatile place for it to go on the bench. 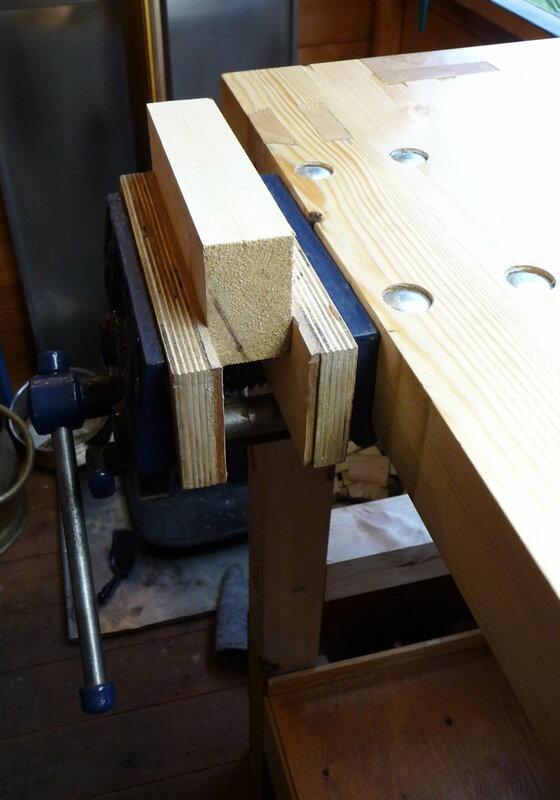 Another important feature of Roubo’s bench is the adjustable-height planing stop. Mine is a significantly different design, though it performs the same function. 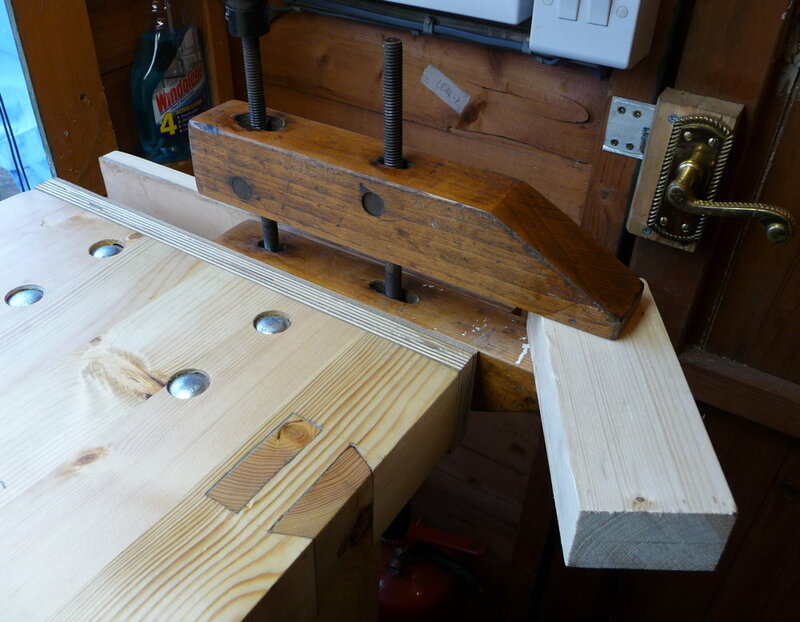 I made it from a limewood board without any metal teeth on the top, partly to avoid marring the work but mainly because I don’t want to risk accidentally running into it and damaging the plane, particularly when planing very thin stock. 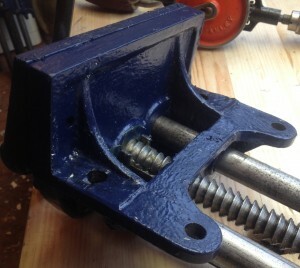 There is a wing nut under the bench that allows it to be clamped at the desired height. 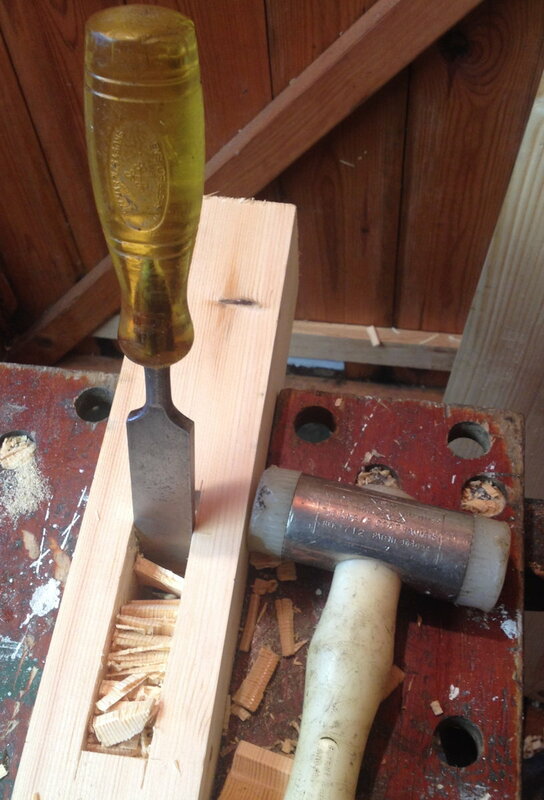 A feature of Roubo’s bench that I didn’t copy is the crochet; the hook on the front that you would use to wedge the end of a long board when jointing. It didn’t really make any sense given the fact that I can’t easily remove my front vice, which in any case can easily be used to clamp the end of a long board. 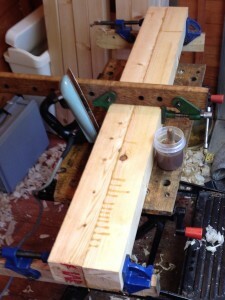 I don’t yet have any bench hooks or shooting boards, though I plan to make some soon. 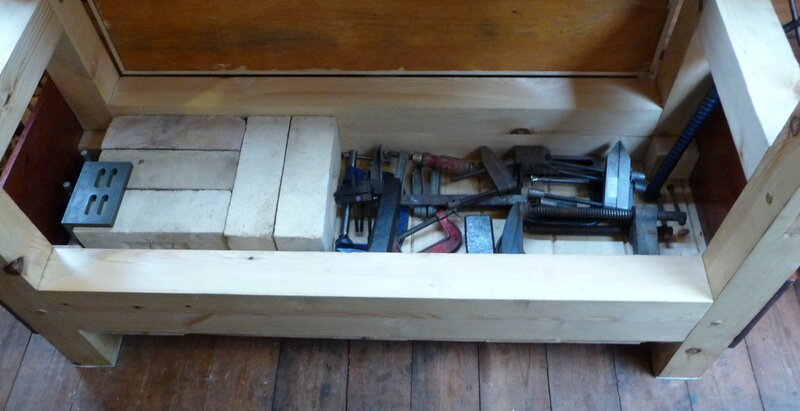 My plan is to store heavy things in here, thus lowering the bench’s centre of gravity and making it more stable. 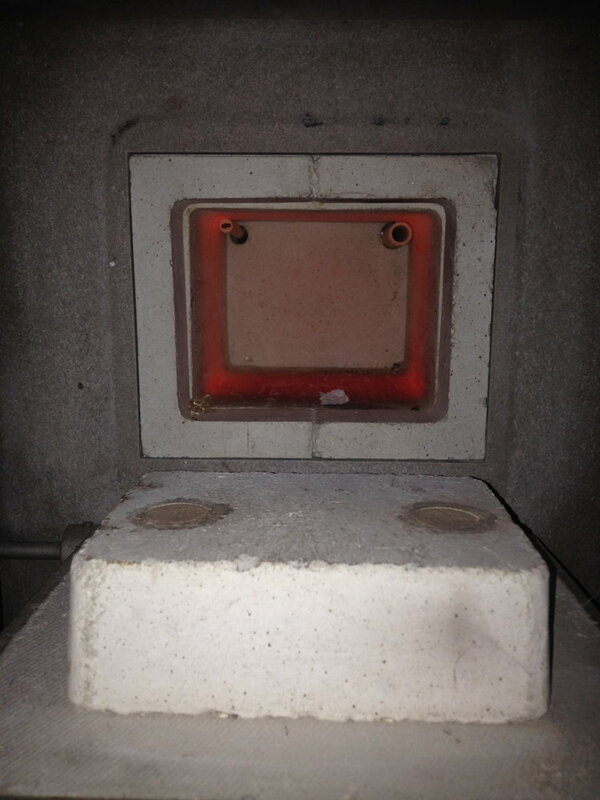 Currently it contains five fire bricks (! 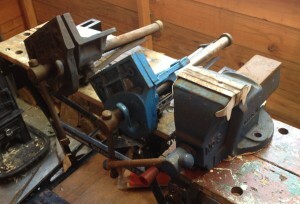 ), a bunch of metal clamps, and a couple of small anvils. Combined with the fact that the bench structure itself is very rigid, the two other things I did to stop the bench moving around in use were that I glued rubber pads to the bottom of each leg and I attached the tops of the legs to the wall of the shed with angle-iron brackets, after bolting a steel channel to the wall to make it more rigid. I’m very pleased by how well this has worked. Light is extremely important for fine detail work of the sort found in concertinas. Of course I put the bench next to the window to pick up what natural light I can, but that isn’t much use when it’s dark outside! 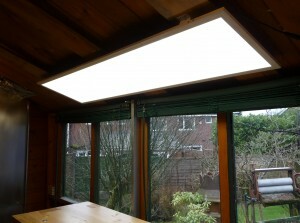 The ceiling is too low for a conventional fluorescent light tube above the bench, and spotlights are problematic because they cast light and dark areas. After a bit of research I found out about LED light panels. I bought a 300 x 1200mm 40W daylight panel and fitted it directly above the bench, and I was amazed by the quality of light it produces. It is like being directly under a skylight on a bright day. (On the negative side, I also replaced the bulbs in the two batten light fittings with newfangled LED filament bulbs, and I found those to be a bit disappointing: slightly dimmer than the claimed equivalent tungsten bulb, with a very dim patch directly below the bulb). 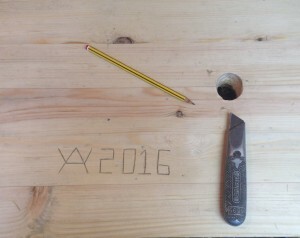 To finish up, here is a selection of pictures from the construction process. The wood I bought to construct the bench, mainly 3″ x 3″ planed “redwood” (i.e. Scandinavian pine). 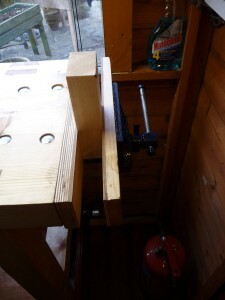 IIRC it cost about £40 including the T&G on the left that I used for the bottom of the tool box (the lid was a piece of scrap plywood I had lying around). First I had to restore my Record No. 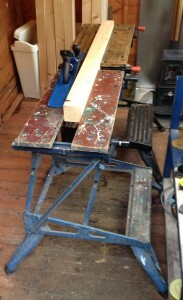 7 jointer plane, which I had never really had a use for before now, not being a furniture-maker. 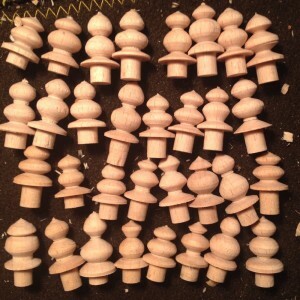 I glued one joint at a time using hot hide glue and three sash cramps (it might have been preferable to use a couple more, but I was horrified when I found out how much decent ones cost). My vintage electric iron was used to preheat the wood to extend the glue’s open time. 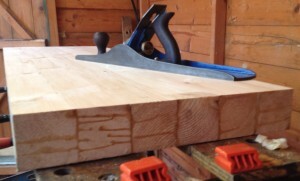 Then I flattened the top surface with the jointer plane. After final assembly I re-flattened it, and was surprised to discover that in the intervening couple of weeks it had cupped by about 2mm. 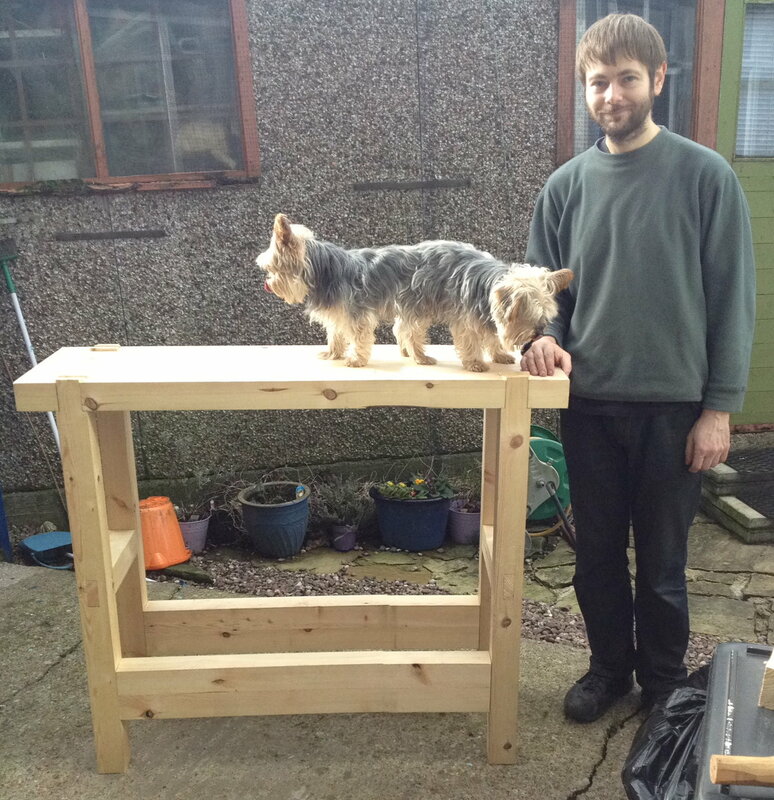 First assembly of the bench, with Pippin the pushme-pullyou dog (this was an accidental trick photo caused by my dad activating the panorama feature on my iPhone). All three vices needed a good cleanup and repaint. The Woden vice also turned out to have had the quick release mechanism modified in an inexplicable way that prevented it functioning – after reversing the bodge it worked fine. Annoyingly the new paint didn’t dry very well at all, and after several days I got fed up waiting for it to harden and fitted them anyway, resulting in the very soft paint rubbing off in a few areas. 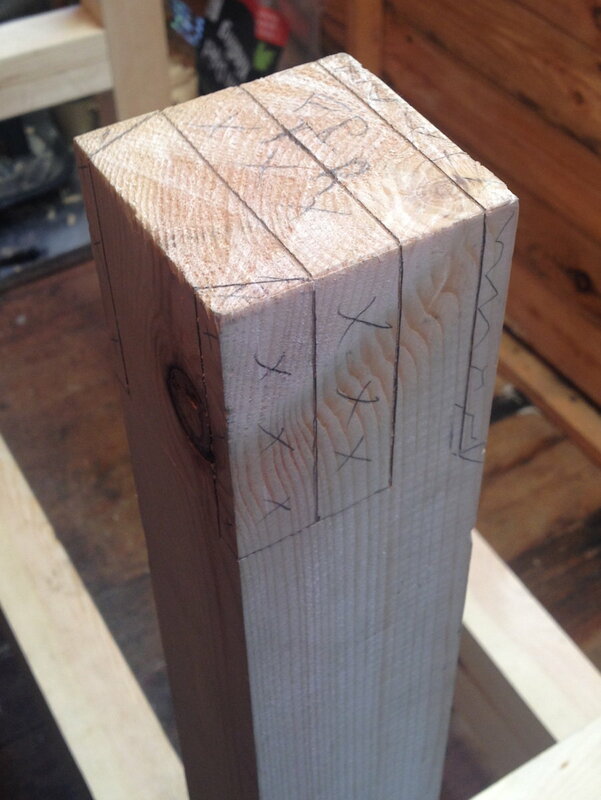 Making riven beech pegs to hold the joints together. I didn’t use any glue, or even bother to drawbore them. 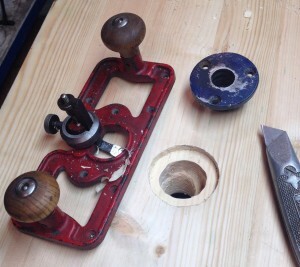 Setting the hold-down collar into the benchtop using my router plane. The fixed jaw of the end vice was morticed into the benchtop to avoid having a gap between the end of the bench and the wooden jaw. Unlike the Record vice, the Woden one had a really rather wonky top surface where it bolts to the underside of the bench. 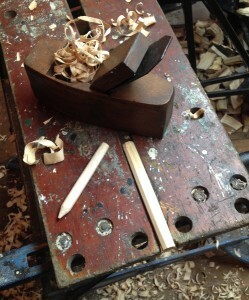 The long stretchers were held into the legs with both a peg and a pair of wedges (which open the tenon out into a deliberately tapered mortice). This is a very strong joint, even without glue. 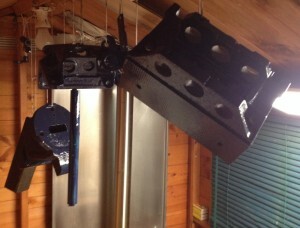 Getting the wedges out if I ever want to disassemble it will probably be a bit of a struggle though. Simply screwing the hold-down collar to the bench top didn’t work very well; when I tightened the clamp the screws started to pull out, so I fixed the problem by making this steel clamp plate that goes on the underside of the bench. The screws are M5, stainless steel. The short section of benchtop behind the planing stop shrunk and split after a few days, so I cut it out and scarfed in a chunk of dry oak instead. At some point I hope to save up enough money to replace it with something a bit bigger and more substantial that is designed from the ground up to be dry, insulated and secure. 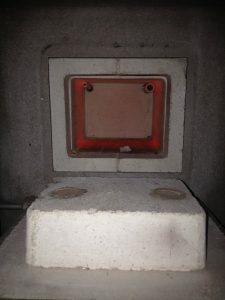 For now, my plan is to install a tiny coal stove (which can later be transferred to the new workshop), repaint the outside walls, add more ventilation, and store as little as possible in there when I’m not actively using it. 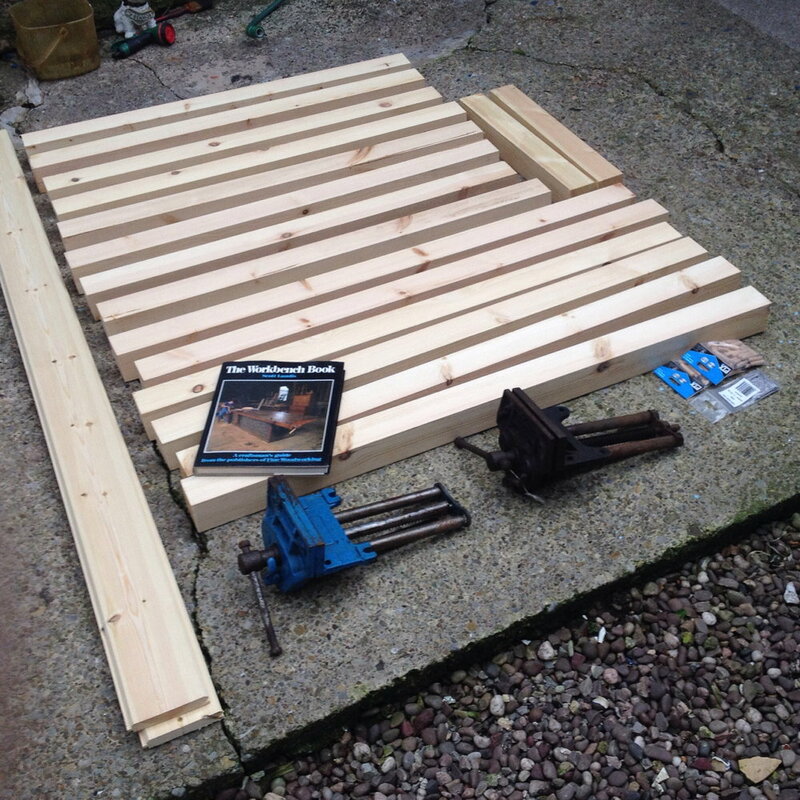 The first thing I intend to make in the new shop is a workbench. Nothing massive or fancy, just a solid pine worktop (made from a spare kitchen table I found in my parents’ loft) at a convenient height, secured to the floor/wall, with some old cast iron vices and a planing stop. After years of working on flimsy trestle tables and Black and Decker Workmates, it will be great to have a sturdy fixed bench that doesn’t skitter across the floor when I try to plane something. In a stroke of good luck, just as I was starting to think about workbench design, I happened to stumble across a copy of The Workbench Book by Scott Landis for a couple of pounds in a local charity shop. It’s a hefty book filled with inspiring ideas. 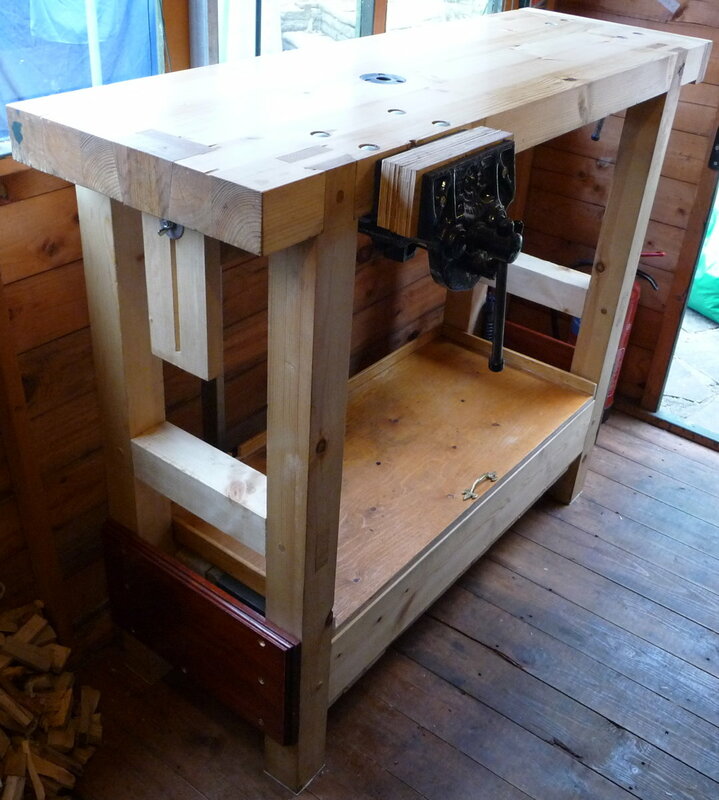 My first self-built workbench probably won’t be my last, but seeing what other woodworkers are working on has helped me to identify more clearly what features I think I will find most useful for the type of work I do and avoid some things I might have regretted later (e.g. 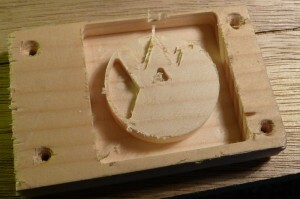 I don’t want any dog holes in the top: too easy to drop small parts down them). 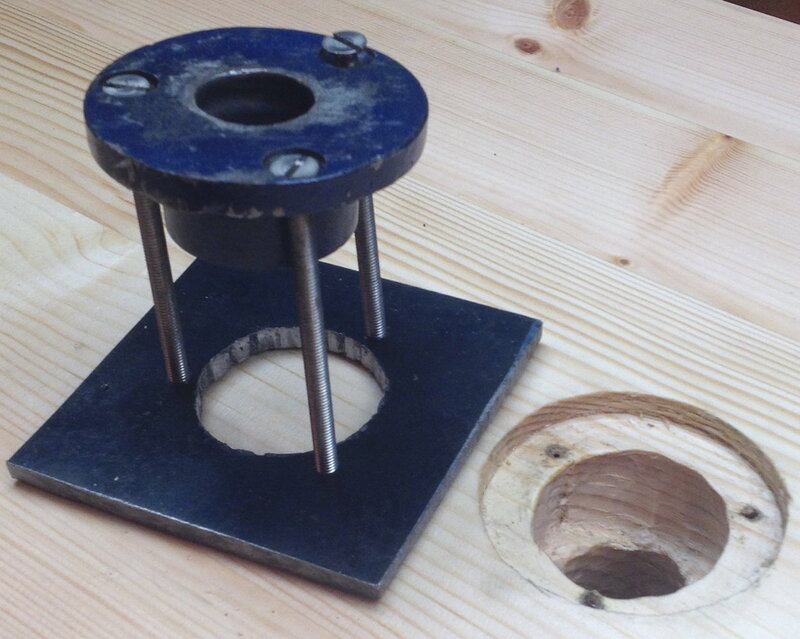 Tool that is the bare-minimum cheapest way to perform an essential operation. 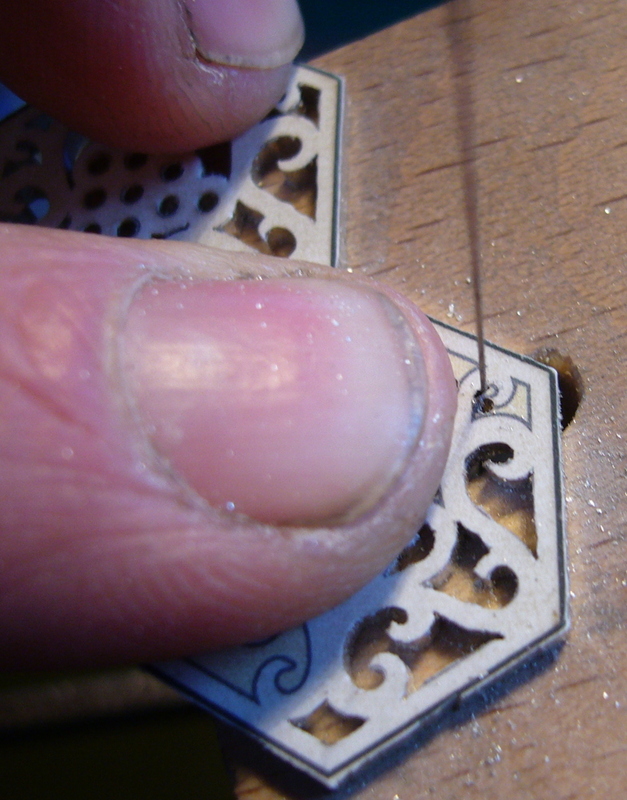 For example, it’s perfectly possible to cut out fretwork ends using a cheap and cheerful bent steel fretsaw you can pick up for a quid or two at most car boot sales. 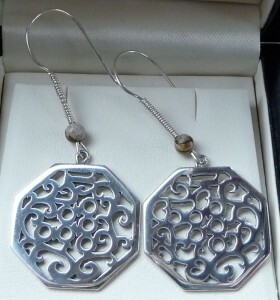 I have a few of these in various sizes. 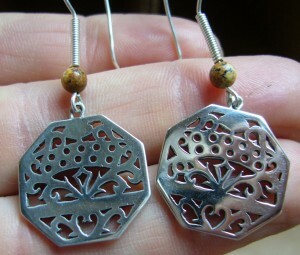 They are a bit slow and tiring to use for long periods, but they are perfectly capable of producing excellent results. 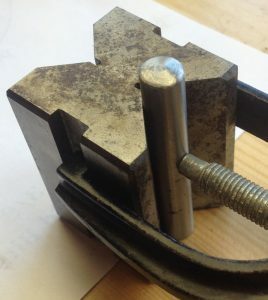 Tool that speeds up an essential operation. For example, a scroll saw is a machine that does essentially the same job as a fretsaw but can cut perhaps four times as fast with less physical effort. The difference is actually probably less significant with more complex designs because you spend so much of your time stopping and moving the blade to a new piercing. I have both a treadle and an electric scroll saw. I should probably get rid of one of them to save space, but I need to do some proper side-by-side tests before deciding which of them I prefer to use. 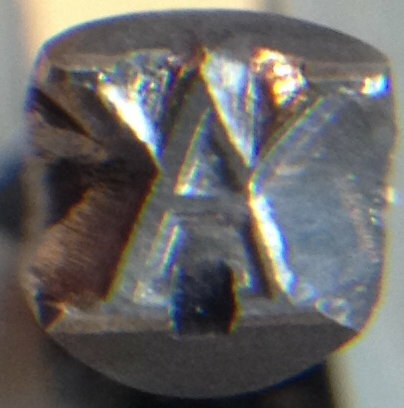 Tool that is a higher quality version of something I already have. For example, my scroll saws are both hobby-grade machines: either will do the job for now, but certain features are inaccurate, fiddly and annoying to use, or not built to last. If in the future I find myself with the budget to upgrade, it would be nice to step up to a higher quality saw like a Hegner, or maybe even a vintage industrial machine. 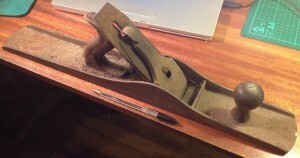 Tool that would be nice to have, but isn’t essential to concertina-making at all. 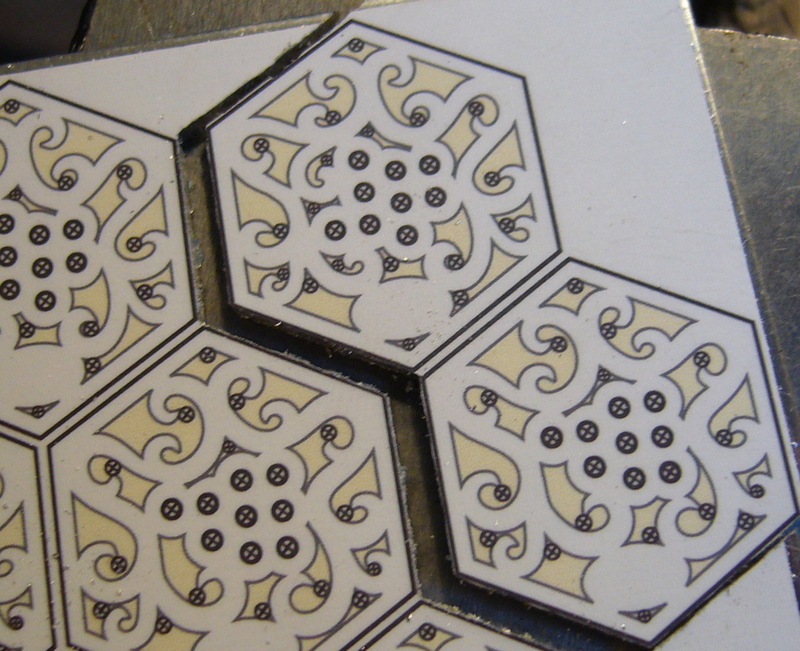 I’m struggling a bit to continue with the fretwork analogy here. 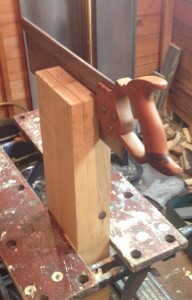 Let’s say an electric bandsaw: one could perhaps argue that it could be used to rough out the blank more quickly than with a handsaw, but it isn’t of any use for cutting the fretwork itself because you can’t get the blade inside a closed piercing (and they can’t cut very fine details and tight curves). It has become a tradition for me to make several Christmas presents each year using whatever tools/skills I have picked up most recently. 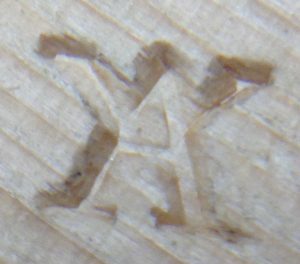 This year my latest tool acquisition is the CNC milling machine, so I decided to do a project that would show off some of what it can do, as well as giving me some useful experience in programming it. A friend suggested trinket boxes. 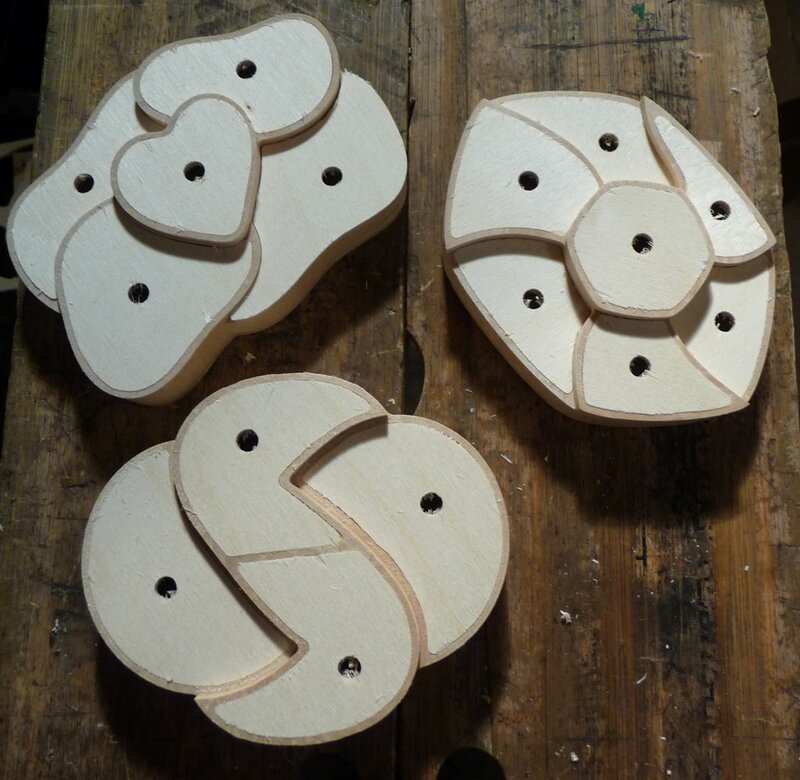 After considering various possible construction methods, I settled on milling them from blocks of limewood with thin plywood bases and lids. I needed to make presents for three people. The nature of one-off CNC manufacture is such that most of your time is spent at the CAD/CAM stage, because you have to plan every detail in advance and figure out how to tell the machine what to do (being careful to avoid anything that is physically impossible, for example asking it to cut a 3mm wide slot when your smallest cutter is 3.175mm in diameter). It would have been easy to design one box and produce three exact copies, but where would be the fun in that? I instead decided to do three different designs. 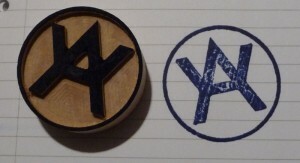 I learned new things from each one and I feel the third design is the best, so it wasn’t a wasted effort. 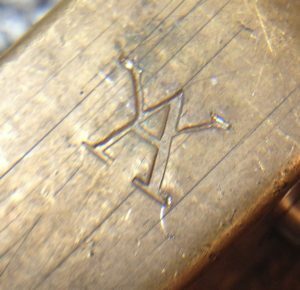 The CAM workflow was basically the same as with the maker’s mark stamp except the designs and machining operations were far more complicated. 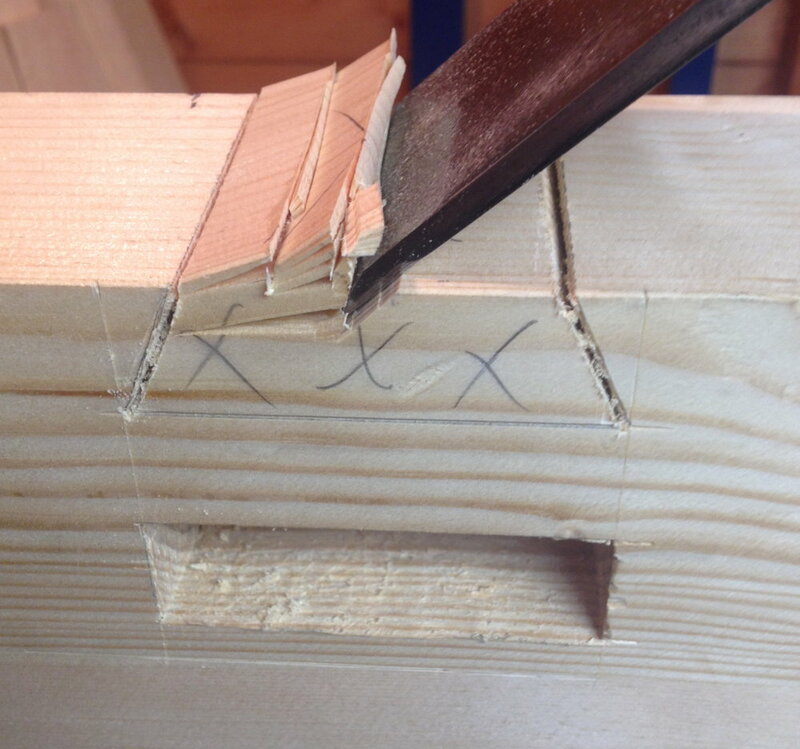 An additional step was deriving the profiles of the lids from the shapes of the rebates they sit in; this was complicated slightly by the fact that I needed to round off all the points because the internal corners of the rebates can’t be any sharper than the diameter of the router bit. The milling operations themselves mostly went OK. I suffered one stepper motor stall while milling the first box, but I heard it happen and managed to hit the e-stop in the nick of time before it did any noticeable damage. I made one design mistake: one of the lids was cut to the wrong outline (you can see it in the next photo). I didn’t spot it at the simulation stage because it was approximately the right shape for the compartment, just slightly too big. The boxes looked pretty plain with ordinary birch plywood lids, so I bought a selection of patterned decoupage paper on eBay and pasted various combinations to the lids. I also pasted plain coloured paper to the bottoms. 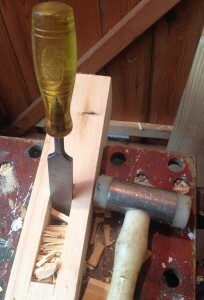 I turned the knobs by hand from beech. 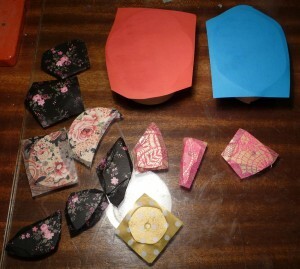 Because there was quite a bit of variation I made more than I needed and picked out sets that went well together. 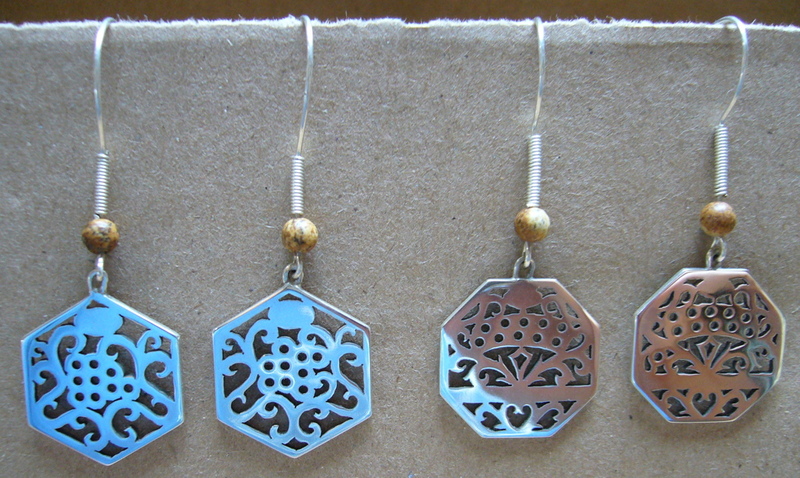 I came up with the basis for the design while playing around with mathematical knots. 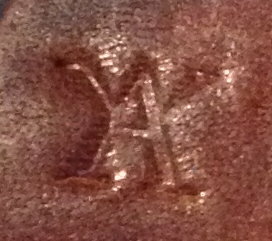 It is based on the 8 18 knot. 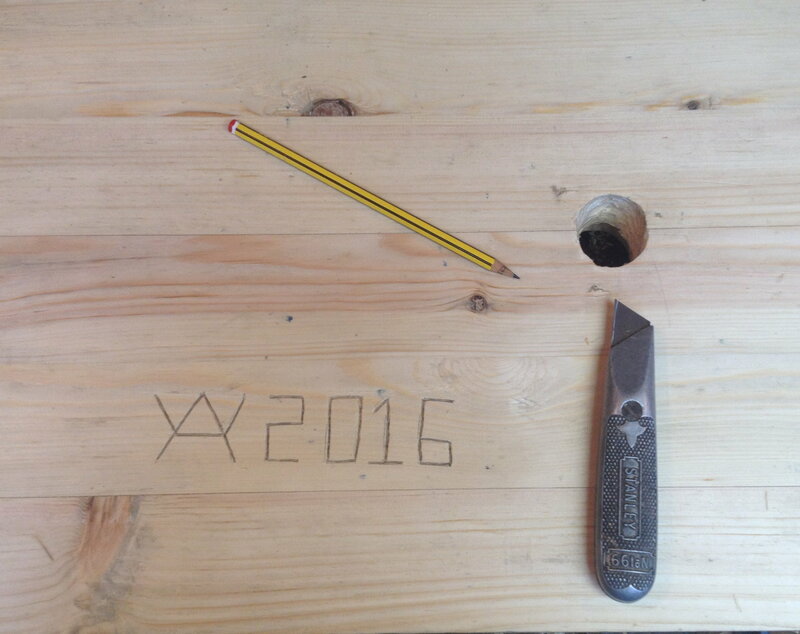 Incidentally I now have an Instagram account and I’m using it to post pictures of things I’m working on. 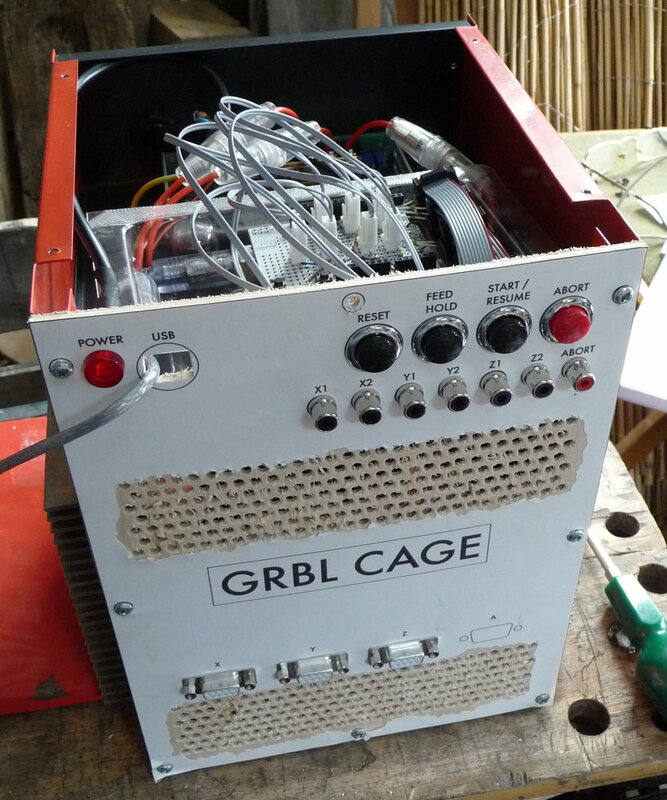 I have a strong family background in mechanical engineering/manufacturing (father, brother, grandfather, cousin, uncle…), and grew up making models and small electronics projects. I did OK academically in high school, but my favourite subject was what at the time they called ‘design and technology’ (a very basic introduction to making things with wood, plastic and electronics). At sixteen I took a two year vocational electronics course, which I enjoyed and did pretty well in. I also did night classes in things like industrial automation with PLCs, AutoCAD, and got my amateur radio license. 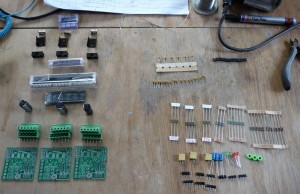 I had a summer job repairing circuit boards at a world-famous maker of professional mixing desks. 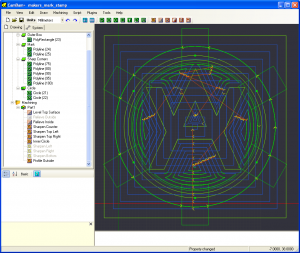 At this point I probably could have dropped straight into an electronics design job (if I could have persuaded anyone to hire me without a degree), figured out what I didn’t know as I went along, and been reasonably successful at it. Instead I went down the default ‘smart kids go to university’ path, and embarked on an electronic engineering degree. I alternately struggled to cope with the large amount of heavy maths and theory, and was bored by the small amount of practical content (which my vocational course had already covered in more depth). After the first year I came very close to dropping out, but was persuaded by family and friends to keep going, because to give up would be to fail and ruin my chances of a well-paid career in engineering (or so it seemed at the time). 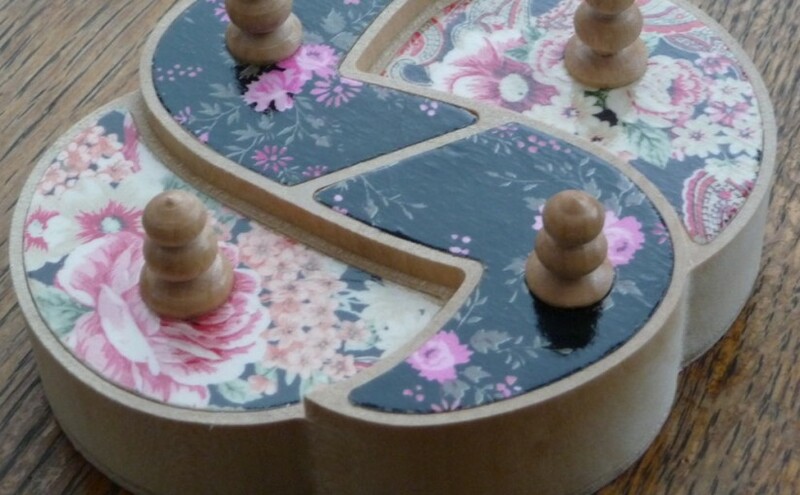 By the end of the course, my enthusiasm for making things had been fairly thoroughly squashed, and I fell into an unrelated desk job in IT that I soon came to hate but felt trapped in. Fast forward a few years and a couple of side-tracks that I need not go into now. 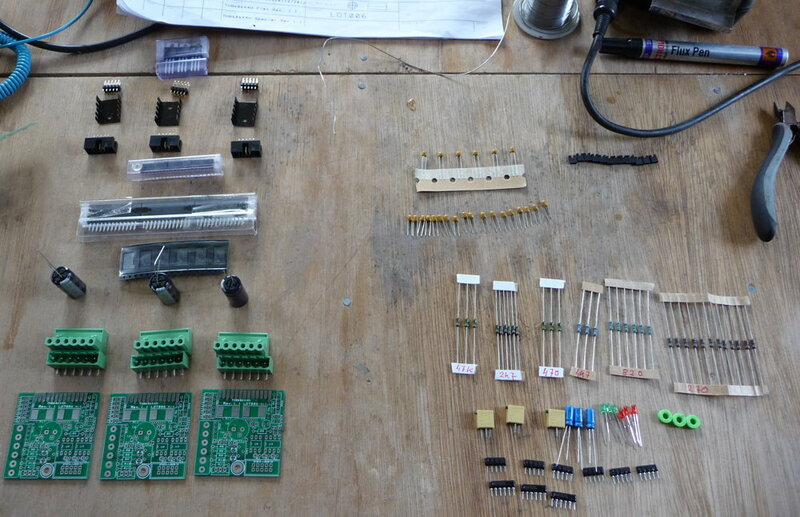 Gradually my enthusiasm for making things returned in the form of hobby electronics projects. I also developed a fascination with old machinery and for a while I put most of my spare time into restoring vintage cars. I became more and more bored and unfulfilled in my day job, and in hindsight I admit I wasn’t performing it to the best of my ability because it no longer held any excitement or interest for me. I should have got out earlier than I did, but I didn’t have a clear idea of what else I could do, given my lack of experience in any industries other than the one I wanted to escape from. In 2009 the IT consultancy I worked for went bust and my situation changed completely. 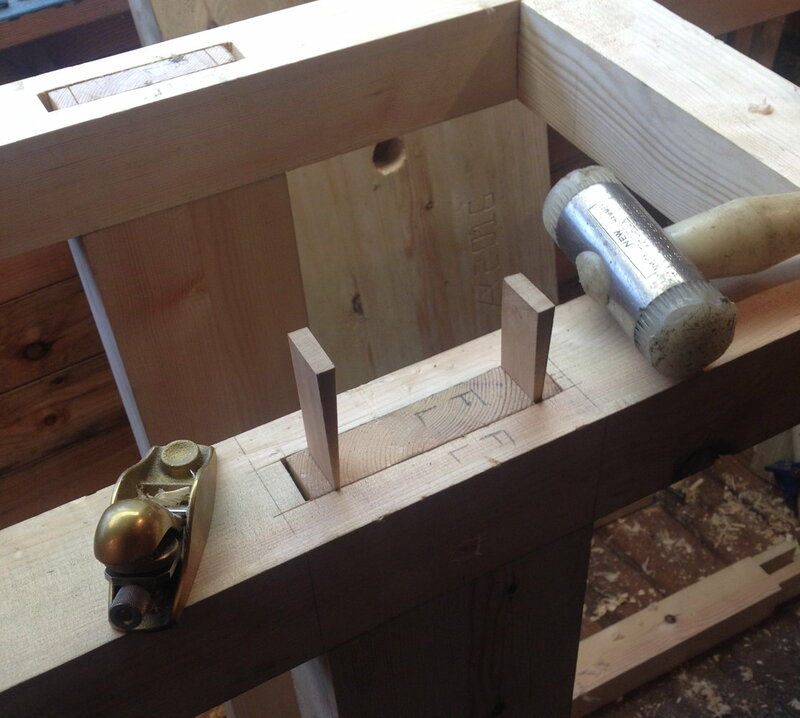 Thanks to my best friend I found myself working on the restoration of a historic building, which involved teaching myself traditional carpentry and masonry skills. I took up wood carving as a hobby and was commissioned to make two sets of puppets. 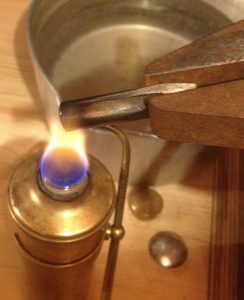 I took up blacksmithing as a hobby because I wanted to be able to forge my own wood carving tools, and was commissioned to make several hundred hand-forged nails. 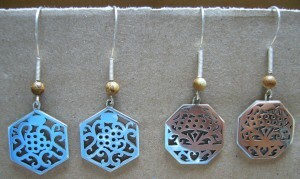 I tried my hand at jewellery making and sold several pieces. 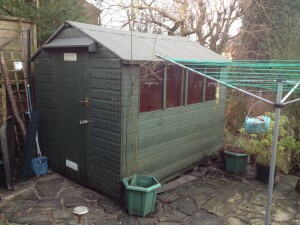 I did more physical labour and became fitter as a result. I was earning far less money than in my previous career, but I had rediscovered the joy of learning new practical skills, making things, and solving problems with my hands. 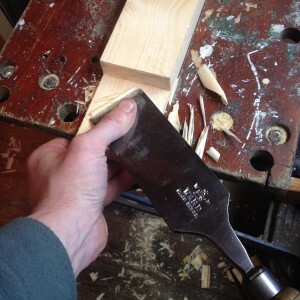 For several years I floated around rudderless from project to project, without a good idea of what I wanted to do long-term, other than that it had to involve working with my hands and brain, preferably involving a wide range of different skills. One day I happened to buy an antique concertina. 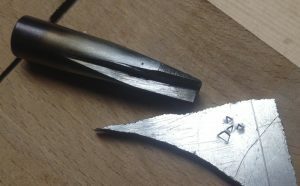 I needed to do a fair bit of restoration and repair work to get it playable, one thing led to another, and in the end I realised that what I really want to do with my life is to become a full-time maker of high-end instruments. 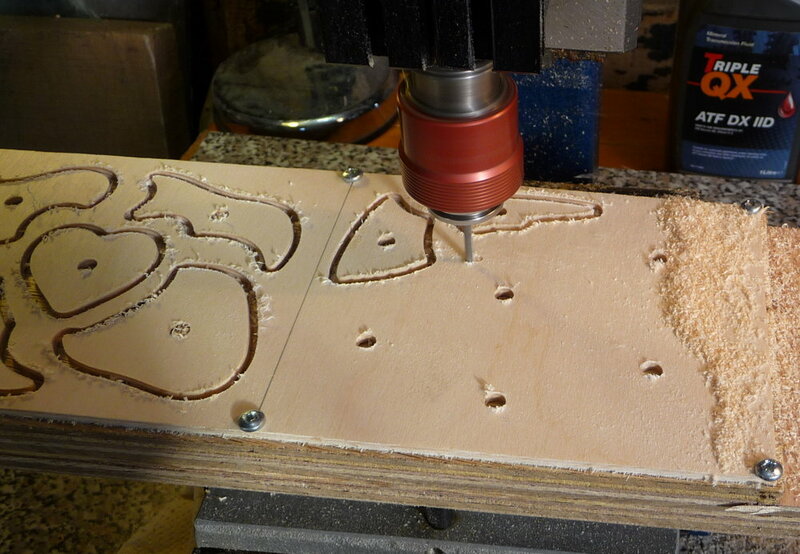 I’ve been spending quite a bit of time recently working on my CNC milling machine and learning how to program it. 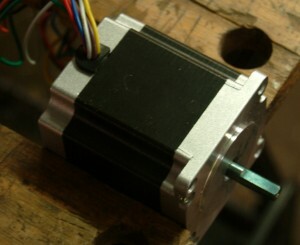 The main improvement I’ve made is to replace the spindle drive motor. 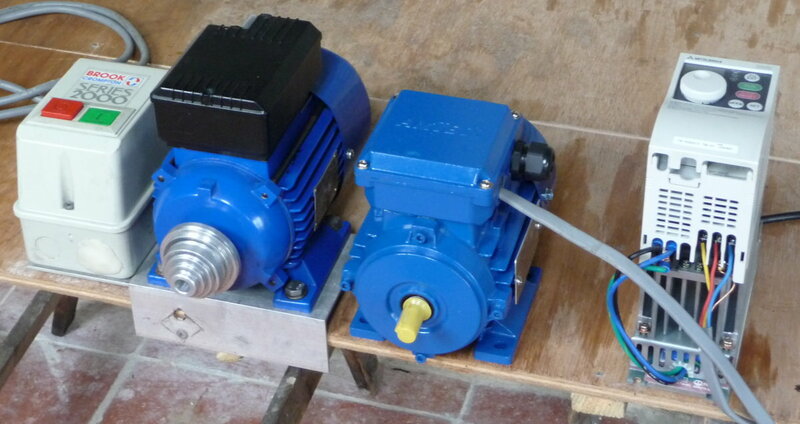 The one that came with the machine was a 1/4HP single phase motor that ran at a fixed speed that gave me, on the top pulley ratio, something like 4000RPM at the spindle. The new one is pretty much the same physical size and weight (maybe a little bit lighter) but it is a 1/3HP three phase motor that, paired with a used Mitsubishi Variable Frequency Drive (VFD) from eBay, can run at any speed from almost 0RPM up to higher than I’ve dared to take it (it’s comfortably fast enough to run the spindle at its rated maximum speed with the standard bearings: 10,000RPM). It’s a fully enclosed industrial induction motor, so it should be robust and have a long lifespan in the presence of dust and swarf. I’m surprised more people don’t go down this route to put a variable speed motor on their Taig mills; it seems almost ideal if you’re happy with the standard Taig spindle. Eventually I’ll probably put a similar setup on my lathe. The main drawback is that it’s fairly complicated to configure the VFD to get it to perform optimally. The VFD replaces the contactor (the glorified on/off switch bolted to the old motor) and I won’t be mounting the VFD on the side of the new motor, so that has reduced the weight on my Z axis a bit more. 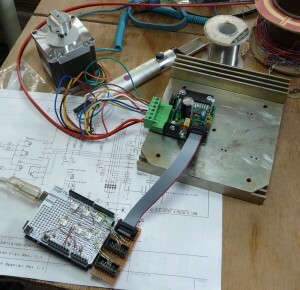 The VFD can take an analogue voltage input to set the speed, and the machine controller I’m using can output a PWM signal when the G-Code commands it to switch the spindle on, so at some point I’ll build an interface board to connect the two together. 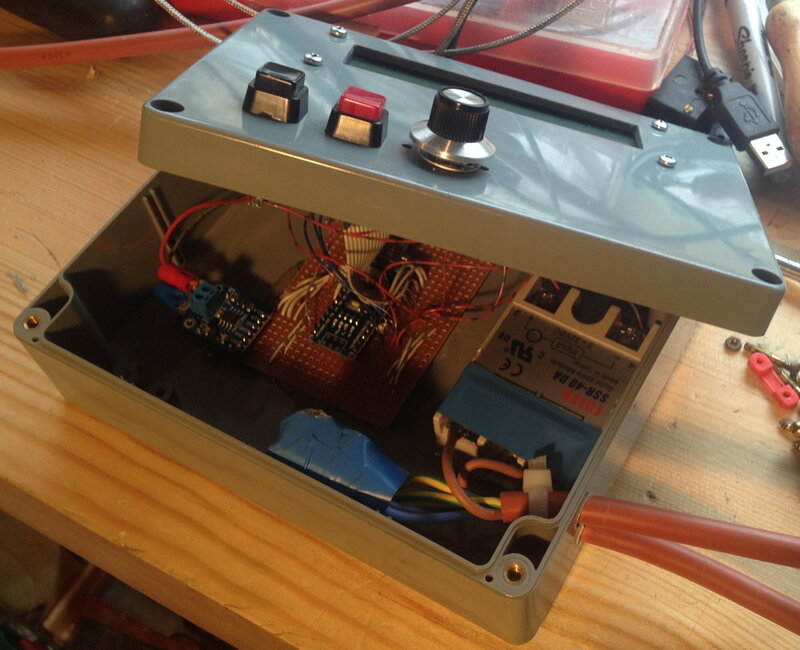 For the time being I’m just manually controlling the motor using the VFD’s front panel. I wrote a little Python script to figure out what pulley ratio and motor frequency to use to get a particular spindle speed. 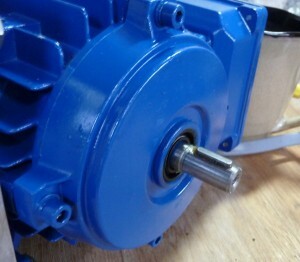 If there’s anything in the new motor setup I’m not totally happy with, it’s the Gates miniature V belt drive. When it’s working well it’s adequate for the task, but the belts are stupidly expensive and seem to be quite easily damaged. 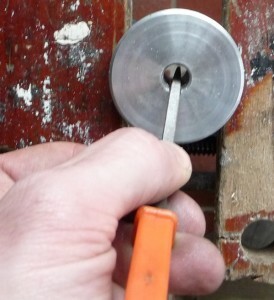 After having a couple go bad recently, I have taken to slackening the motor mounting bolts and releasing the belt tension every time I change pulley ratios and when I’ve finished using the machine for the day. 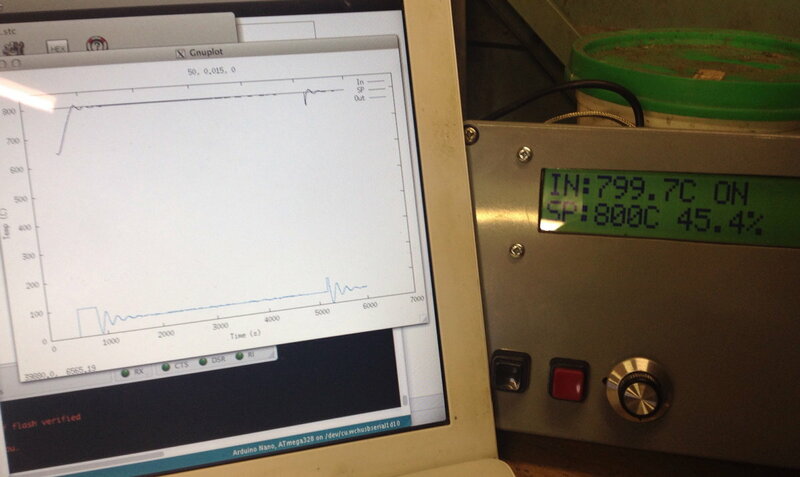 The new motor did show up a problem with the CNC controller. It seems that VFDs put out electrical interference. Lots of it. I had previously found with the old motor that I would sometimes get a spurious E-stop input when I switched it on or off. With the VFD I could get them at any time the motor was running, and also the steppers sounded ‘lumpy’ and kept randomly stalling. 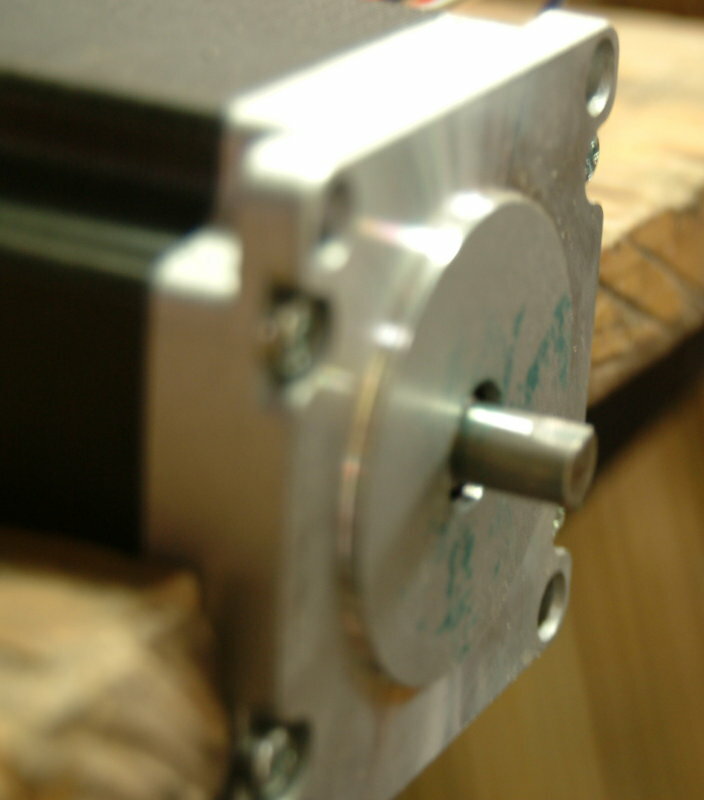 I found that if the spindle motor was running while an axis was doing a rapid move and I picked up the VFD and moved it close to the CNC controller box, the stepper would inevitably stall. Conversely if I moved the VFD and controller as far away from each other as the cables would allow and placed a metal bucket over the VFD, the problem went away. The permanent cure turned out to be that I needed to connect the 0V rail of the Arduino in the controller to the chassis earth star point. Since then it’s been behaving itself. I’ve fixed quite a few bugs in Handwheel and implemented a few new features, and it’s running pretty well for me now. I’ve been doing the development on an old dual-core Macbook Pro and my workshop machine is a quad-core Raspberry Pi 2, and it performs great on both of those. Handwheel is divided into several threads, structured in such a way that as long as your computer has at least two processor cores (ideally four), the overhead of updating the GUI shouldn’t slow down a file send. I decided to check that it worked OK on a standard (not overclocked) single-core Raspberry Pi 1: nope, the experience was dreadful because the rapid GUI updates were chewing up all the CPU and slowing the whole system to a crawl. Several hours of optimising later, the experience on the Pi 1 is now acceptable and faster machines like the Pi 2 are even snappier. I think it will run pretty well on the new super-cheap Pi Zero too, which has the same processor as the Pi 1 but is clocked something like 40% faster. I’m hoping to finally put out an initial public release over the Christmas break. I also got side-tracked into working on a problem that was causing data corruption between the computer and the Arduino at 250000 baud: I tracked it down to the firmware on the Atmega 16U2 processor they use as a USB to Serial bridge, and came up with a fix. 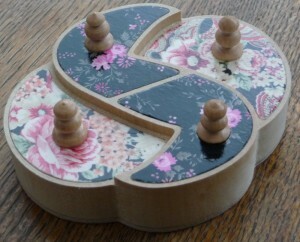 I’ve started learning how to take a design and make it into a set of instructions to control the machine. 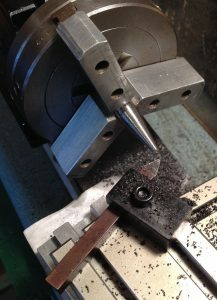 This is called Computer Aided Machining, or CAM for short, not to be confused with Computer Aided Design (CAD), which is basically a way to do engineering drawings on a computer. 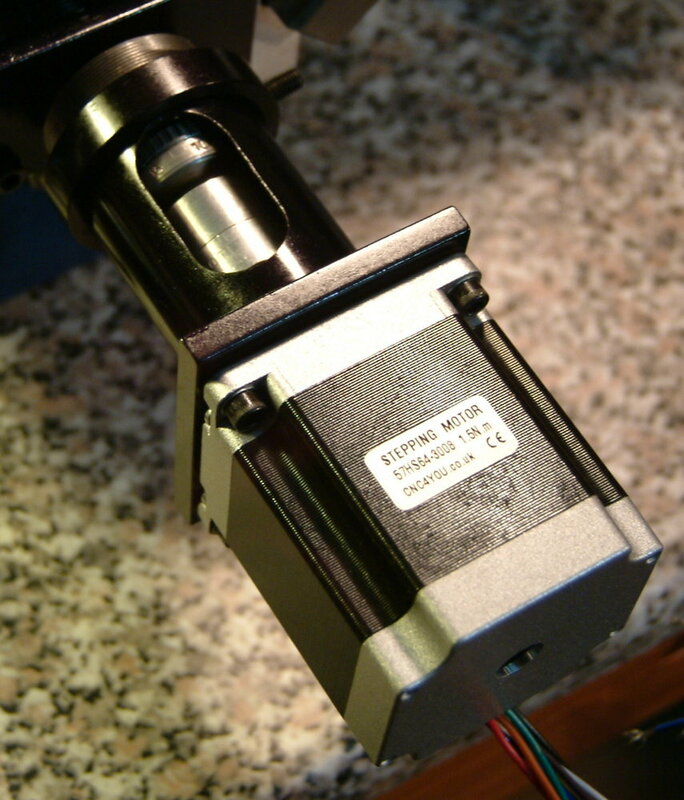 There are a huge number of CAM programs available, with a wide range of capability and maturity at prices from free up to thousands of pounds per year. After quite a bit of research I settled on a program called CamBam, which seems to be the most capable option I could afford. Awkwardly, because it’s a Windows program and I’m a Mac user I ended up also buying a second hand Windows XP license and installing it on a virtual machine. 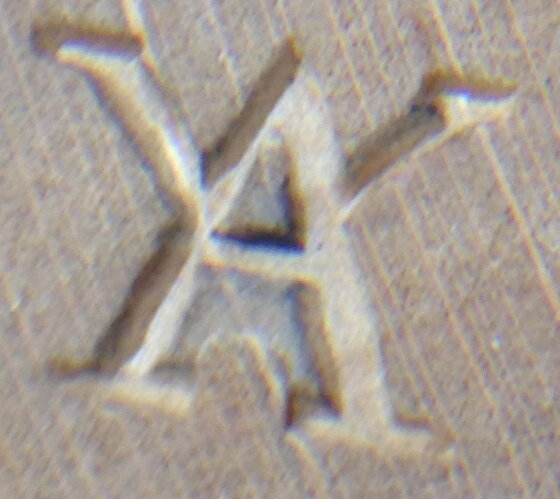 A little bit clunky, but it seems to be working OK.
There’s a pretty steep learning curve to CAM, particularly as I haven’t got a great deal of experience or any formal training on manual milling machines. For example when milling manually I would guess at a spindle speed and depth of cut, then adjust the feed rate by gut feel based on the sound of the tool (and perhaps how much smoke/steam was coming off the cutting lubricant!). 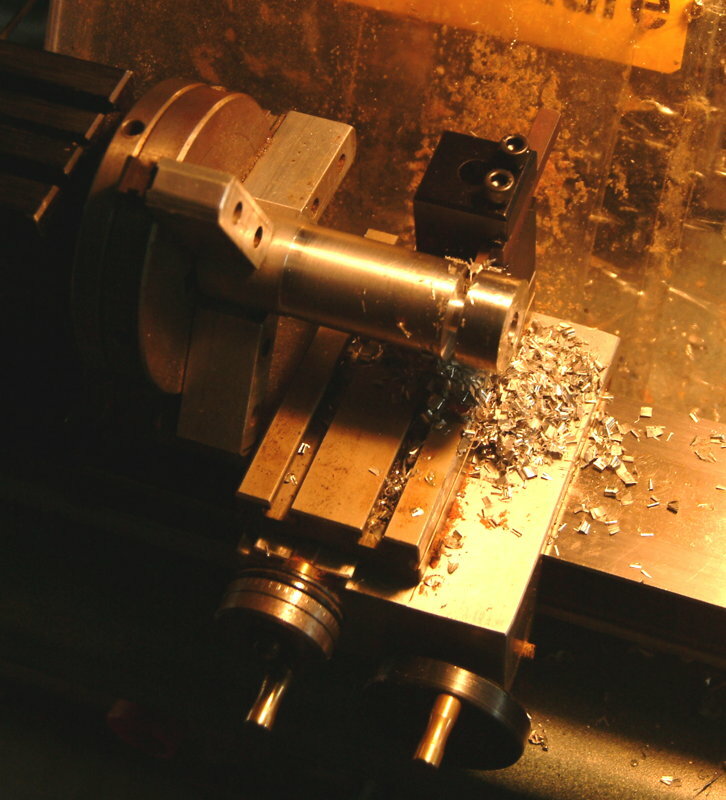 With CNC you calculate the parameters in advance, configure them in your CAM program, double and triple check everything, and hope you didn’t put a decimal point in the wrong place and accidentally command the machine to stab the end mill into the work at 500 miles per hour. 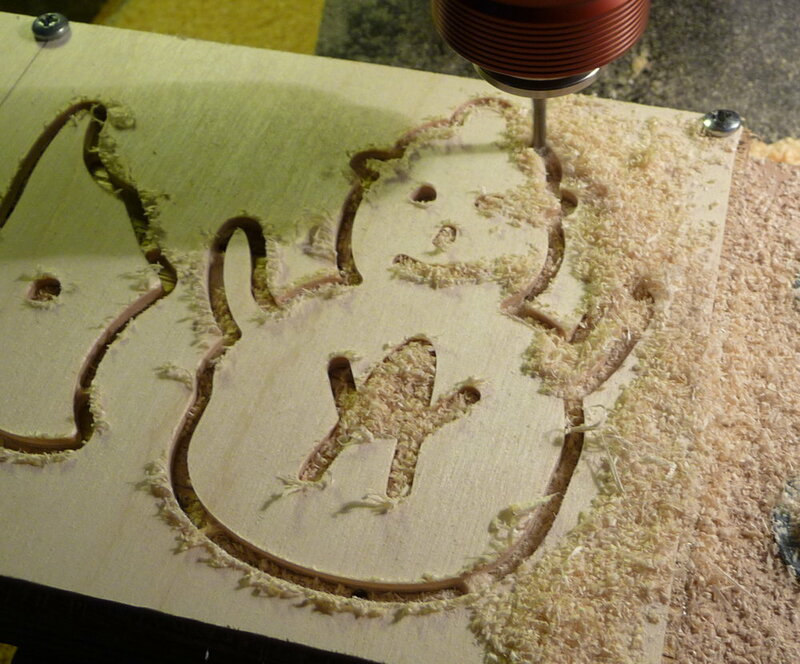 Actually, I’ve found with my initial experiments with routing wood using carbide bits, the limiting factor in how fast I can cut is my machine’s top speed (1400 mm/min, 55″/min), which is set by how fast the Arduino running grbl can emit step pulses (30KHz). As a result I’ve been turning down the spindle speed to something like 5000-7000 RPM in order to get a decent chip load and avoid making a lot of dust and heat. It isn’t really a problem for what I’m doing with the machine, but I must admit the part of me that wants to optimise everything has been considering overclocking the CPU in the Arduino to increase the maximum pulse rate! 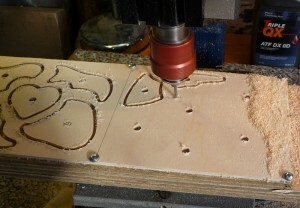 The first thing I milled under CNC control was to flatten the top of a plywood spoilboard I made that bolts to the bed of the machine and allows me to easily screw down work and to cut through it without damaging anything important (when it gets too chewed up I can re-surface it, and when it gets too thin I can glue a new piece of plywood on to build the height back up). While developing the CamBam design, it was extremely useful to be able to be able to simulate what would happen if I was to machine the part. 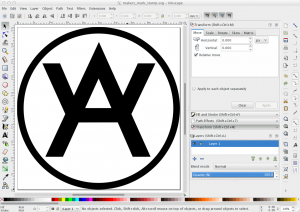 For this I used an open source program called CAMotics (formerly OpenSCAM). It’s still a little rough around the edges but I found it super useful. As soon as I actually make some money from CNC I’ll be sending a donation their way. I’m pretty pleased with the end result. 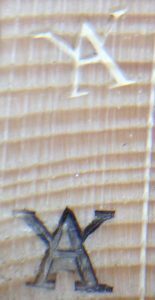 The wood soaked up the ink like a sponge; in hindsight it might have been a good idea to seal it with a coat of shellac or something before using it. A little over ten years ago I bought a manual Taig milling machine with the intention of converting it to CNC. For reasons too boring to go into here, the conversion got postponed indefinitely. It remained in its manual configuration and saw little use (probably a couple of hours a year, mostly as a glorified drill press with XY table). 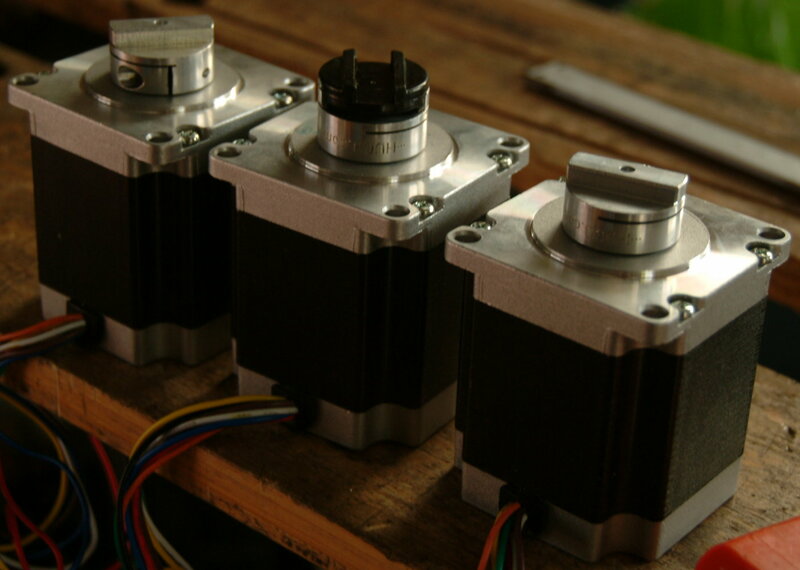 About a year ago I finally started collecting parts to do the conversion: Chinese stepper motors, switch mode power supply, driver boards and an Arduino Uno clone via eBay, and motor mounting kits from Lester Caine at Model Engineer’s Digital Workshop. 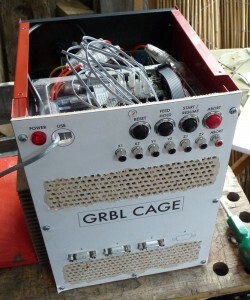 I was happy with most of the components, except for the Chinese driver boards which turned out to be a hopeless waste of money (basically, a design flaw means they only ever run at 30% power level, and poor quality components mean they would probably quickly burn out if you hacked them to work at full power). If money was no object I would have bought Gecko drivers, but they are very pricey here in the UK so I searched for an alternative and found these THB6064AH kits. 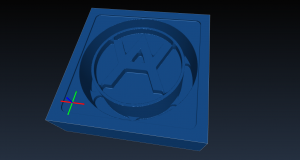 I went for the ‘special’ model because it’s easier to mount to a heatsink. 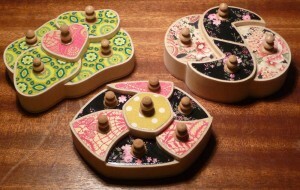 It took me a couple of hours to assemble three of them, and I’m very pleased with the design and performance of them. I mounted them on a couple of large P3 Xeon heatsinks salvaged from old servers. 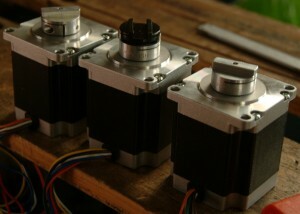 I’ve left space for a fourth driver board in case I ever decide to add a rotary axis for gearcutting or something. They barely get lukewarm. This is currently working fine for interfacing to the drivers, but I think I need to add opto-isolation to the inputs because I’m currently getting an occasional spurious e-stop when I switch my spindle on or off. Luckily it hasn’t happened at any other time and the program execution is always paused when I start/stop the motor, so it hasn’t caused an issue yet. It’s more likely to cause a problem once I get around to fitting limit switches. At some point I’ll probably switch to using an Arduino Nano soldered to a custom PCB with full isolation. Installation and adjustment of the couplers was slightly fiddly, but I’m very happy with the results: no backlash and more than strong enough to handle the motor torque. 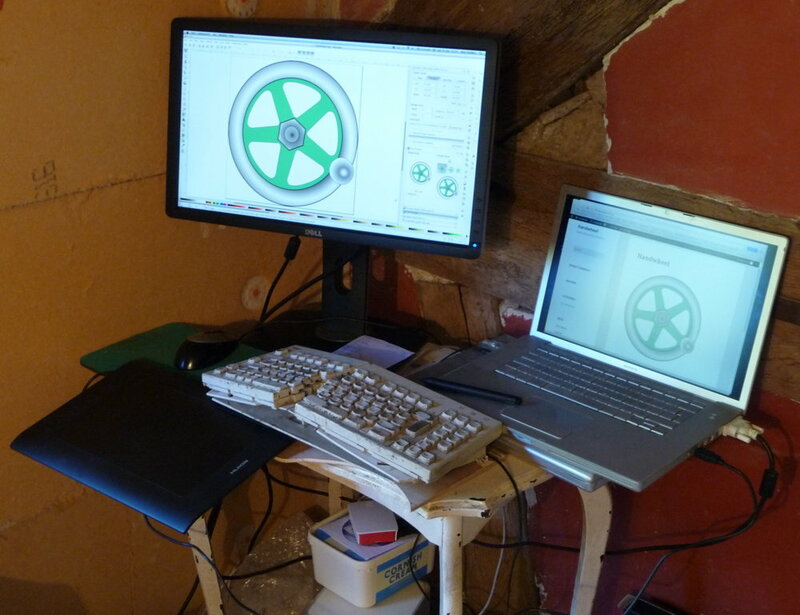 The most time-consuming piece of the project by far has been that I got side-tracked into writing my own user interface software called Handwheel. 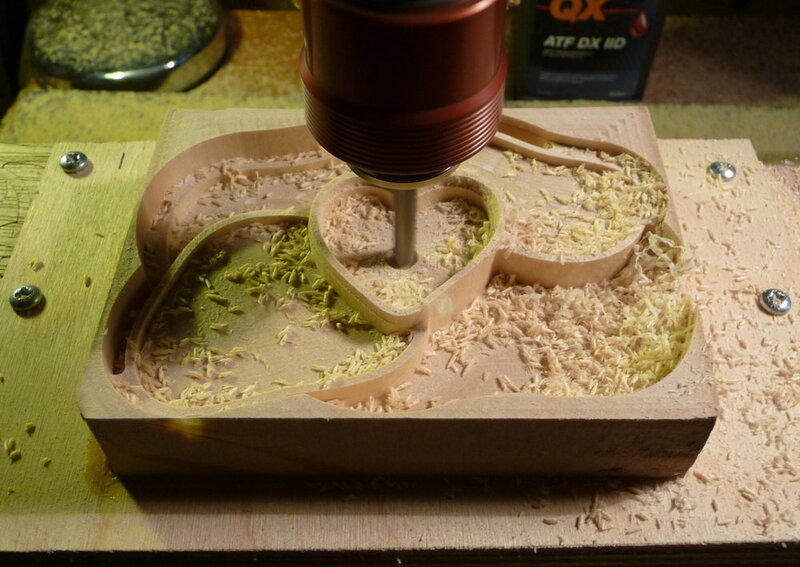 Turns out it’s a huge amount of work to implement a good CNC UI, but I’m pretty pleased with what I’ve ended up with. 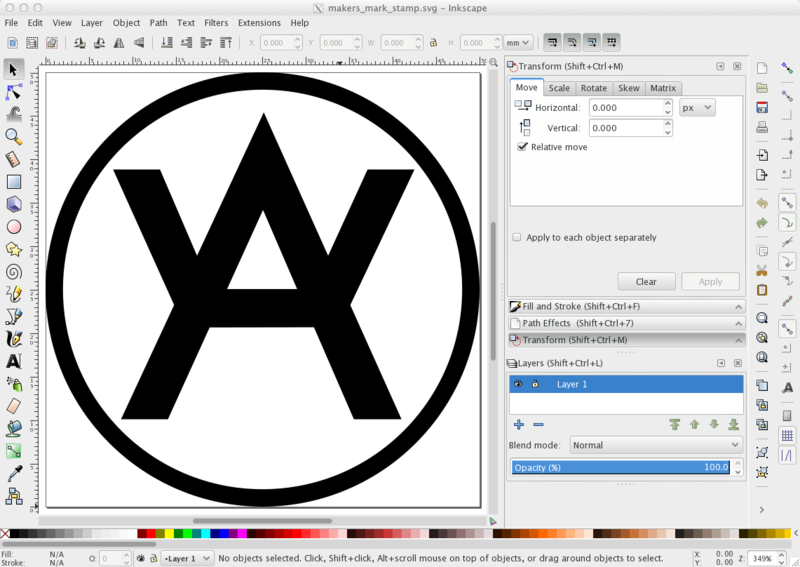 I’m going to release it as Open Source once I’ve cleaned up a few more rough edges and written some sort of user manual. More on that later. To finish off this rather long and rambling post, here is a video of the machine in action. This was slightly nerve-wracking for me, as it was the first time I’ve programmed a CNC machine, the first time I’ve used the mill to cut metal since the CNC conversion, and the first time I’ve used Handwheel on a real part. Just to up the stakes a little, the workpiece was £12 worth of sterling silver! Fortunately everything worked perfectly. 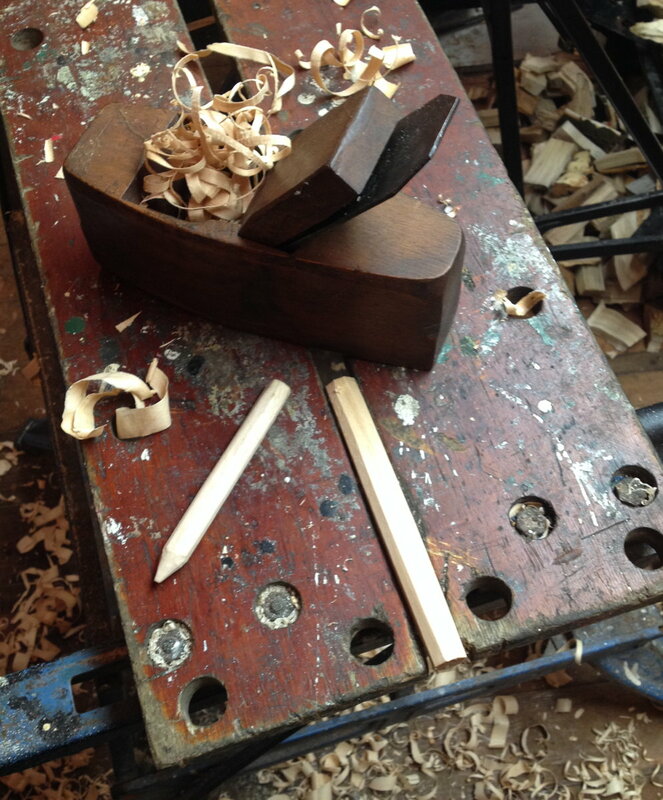 The blog has been quiet for a while because I’ve been very busy over the summer with non-concertina-related projects, but as autumn draws in things are starting to get more interesting here. 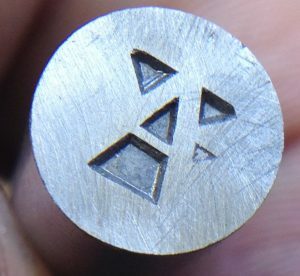 I’ve got a third earring design on the drawing board, my CNC milling machine is nearly ready to make its first cut, and I’m in discussions with a client about developing a couple of exciting new instruments. Yesterday I got a bigger external monitor so that I can fit a lot more on the screen at once when I’m doing CAD/illustration work. 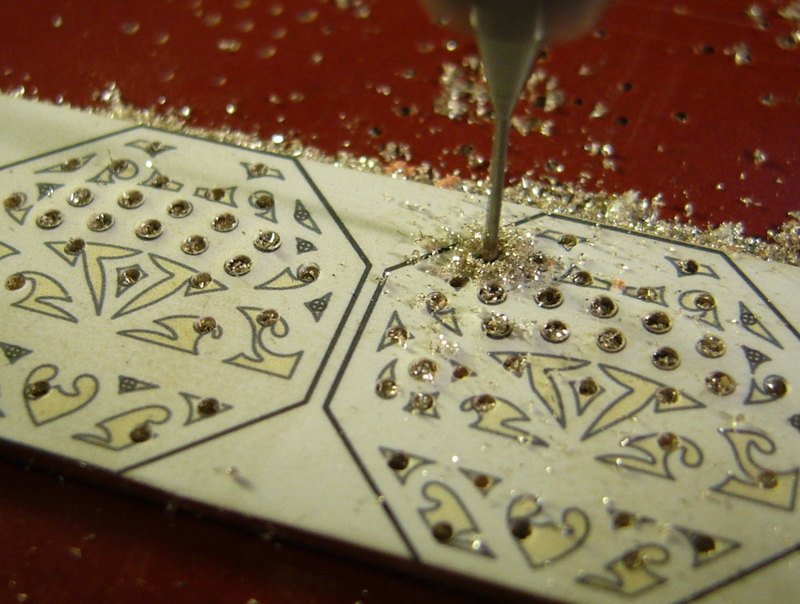 Designing the bellpush fretwork on a 13″ laptop screen was an experience that I’d prefer not to repeat! The design on the screen is the logo for a side project I’ve been working on in my spare time for the past couple of months. 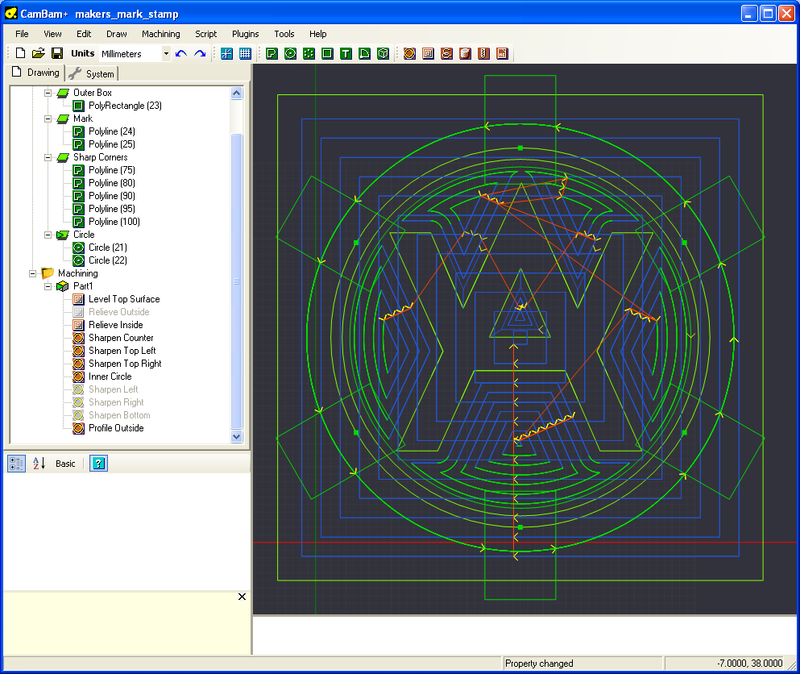 It’s a piece of software called Handwheel for sending instructions to my milling machine. More on that in due course! I just finished off some more earring orders. It was nice to get an order for the octagonal Anglo design; it is a more intricate design than the English and I don’t think I entirely did justice to it when I made the prototype. My tools, processes and skill with the piercing saw have all improved in the past few months and I’m pretty pleased with how the new pair turned out. The inkjet-printable self-adhesive vinyl templates are working out great, particularly after fiddling with the printer settings to get them as sharp as possible. I’ve also tweaked the designs a bit to improve the drill targets. 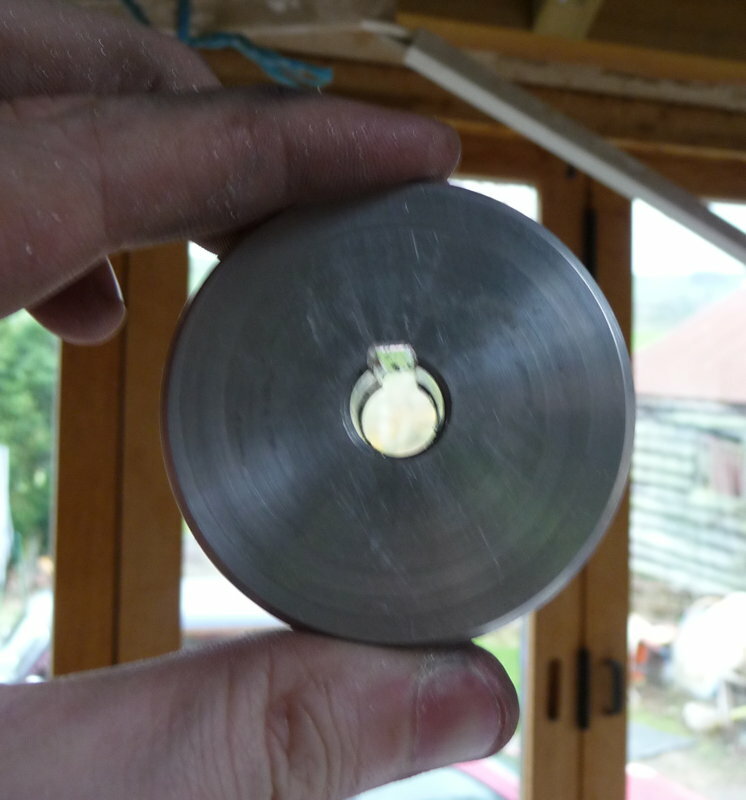 Nice sharp lines on the template really help you to get accurate saw cuts. I do all the piercing with Vallorbe 8/0 blades, the smallest size I can easily obtain.